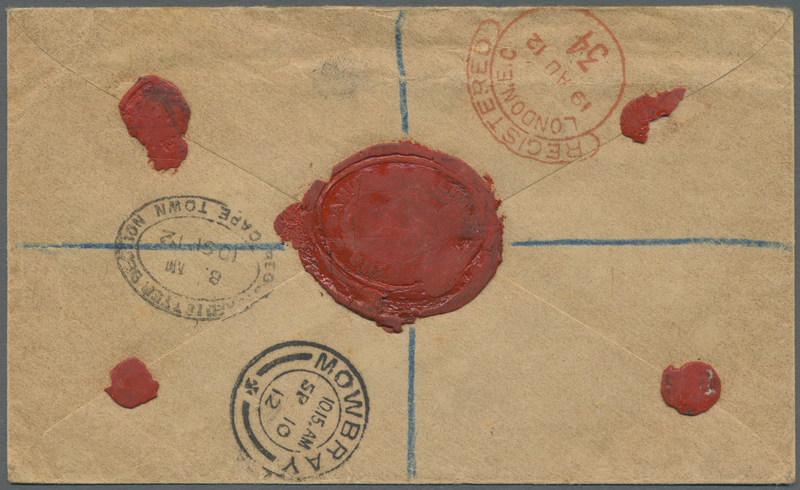 7744 gestempelt (marked) Stempelm. 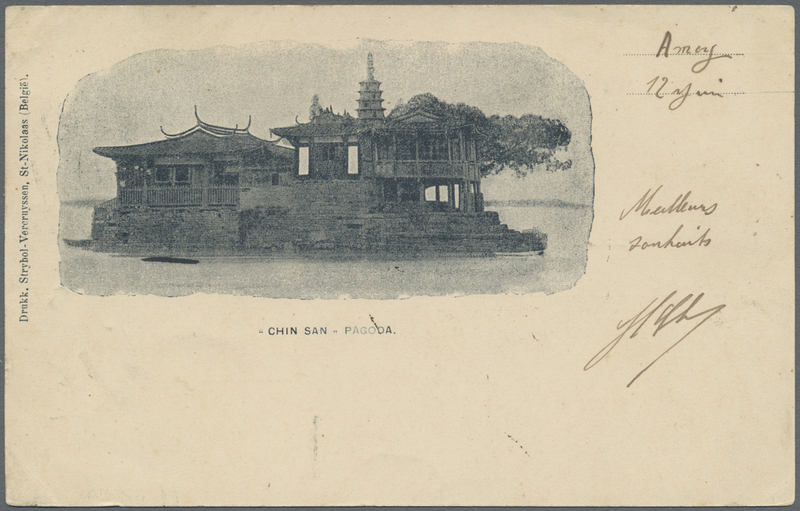 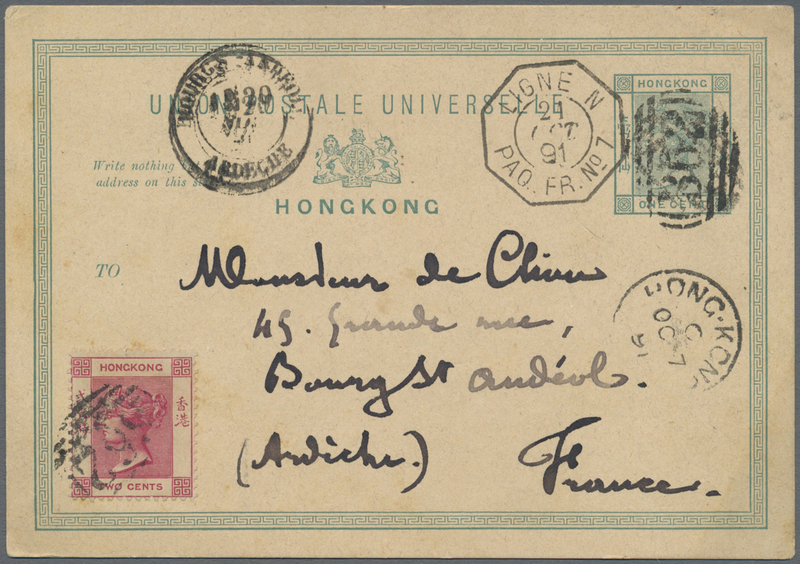 11 Shanghai, 1891, postally used fiscals, $5/$10 red canc. 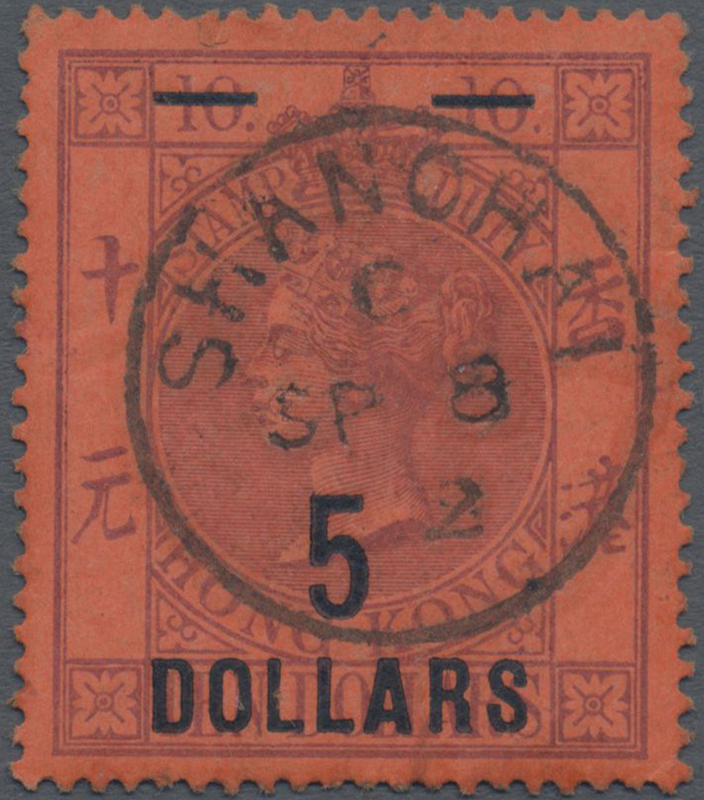 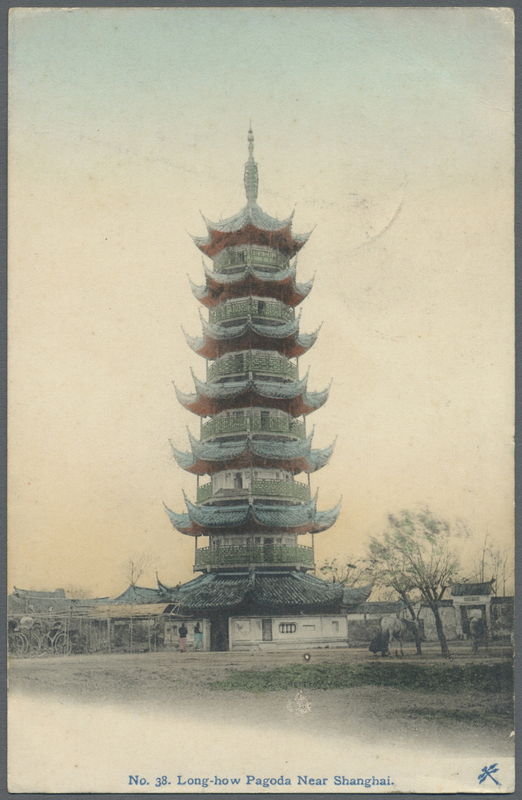 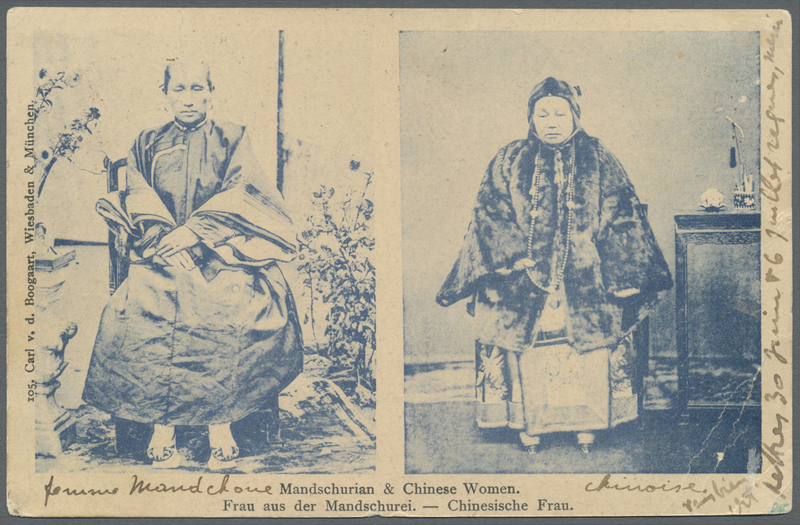 "SHANGHAE C SP 18 92" (SG Z882). 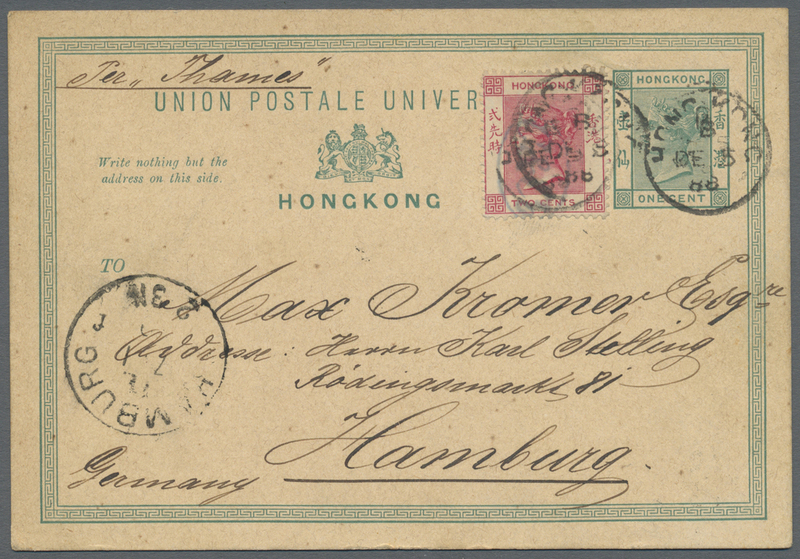 7746 Ganzsache (Complete) Amoy, 1894/97, "A AMOY JA 27 94" on card QV 1 C. to Shanghai w. FE 3 backstamp; "AMOY A JA 5 (9)7" on card QV 4 C. via Hong Kong and "VANCOUVER FE 11 97" on reverse to Menden/Conn., USA. 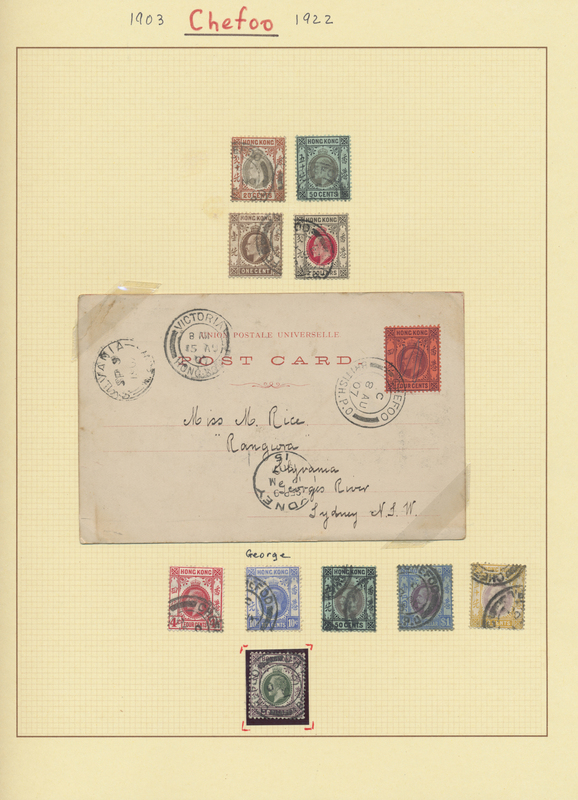 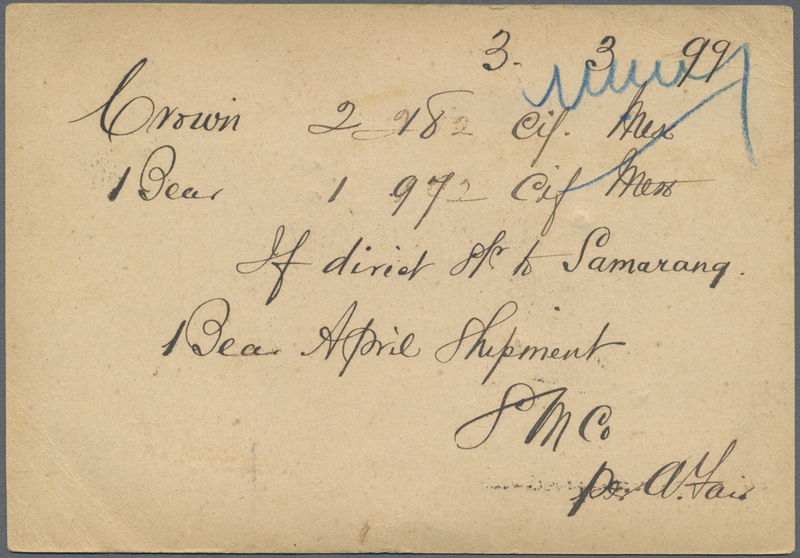 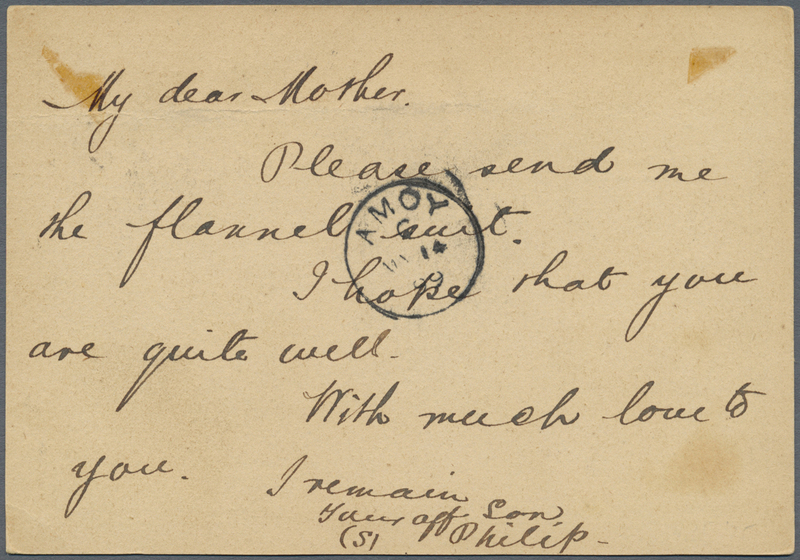 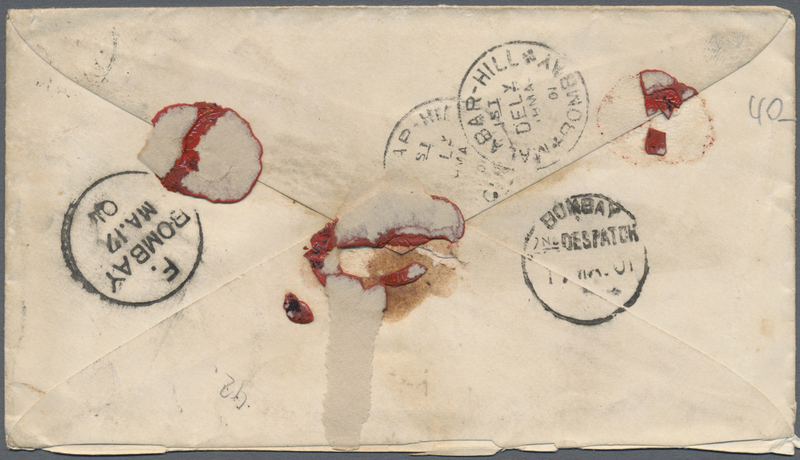 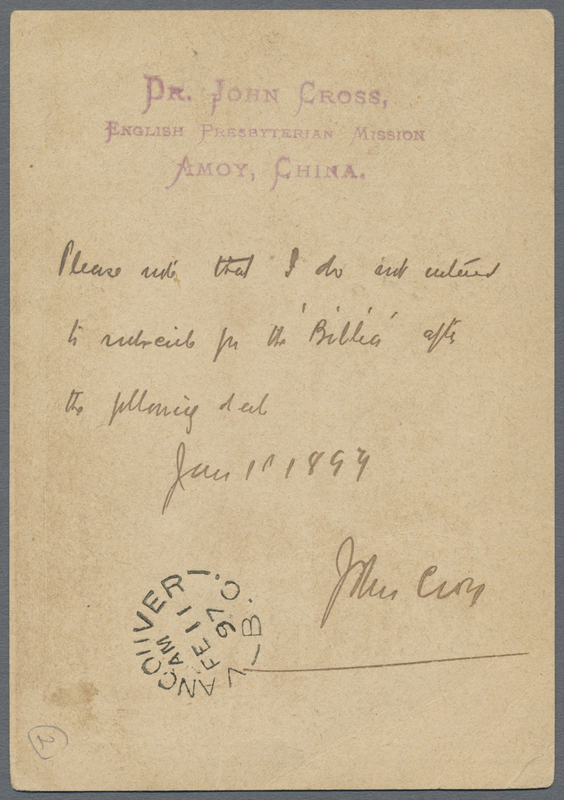 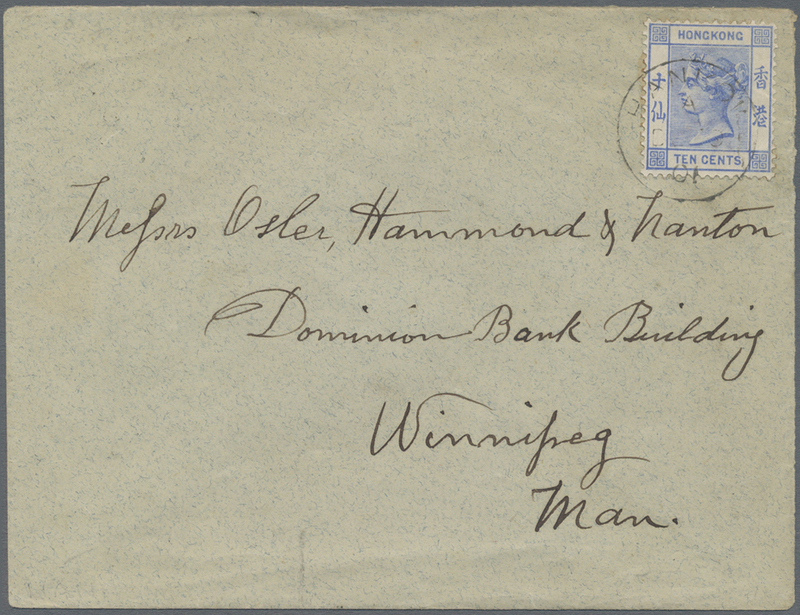 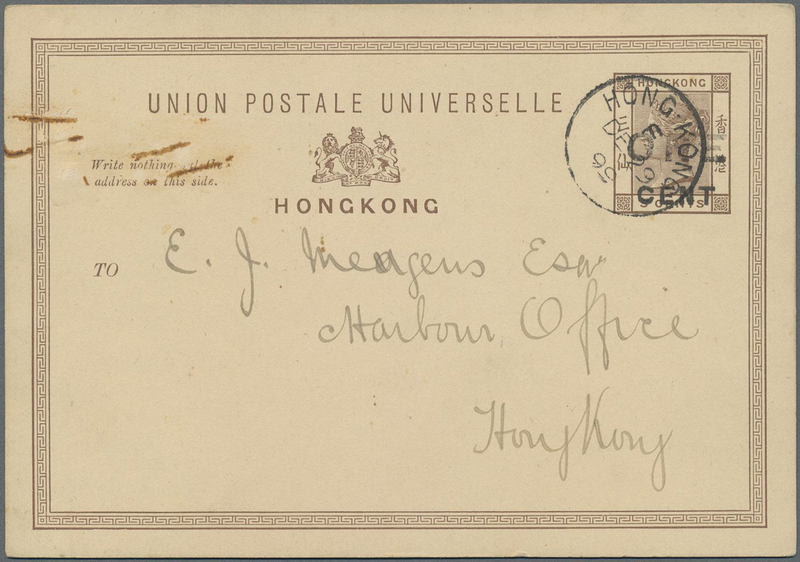 7749 Brief (cover) 58 (2) Hankow, 1900, QV 10 C. ultra (2) tied "HANK(OW) C FE 26 01" to cover to Bombay/India with four transits/arrivals of March 17/18 on reverse, from the Sassoon correspondence. 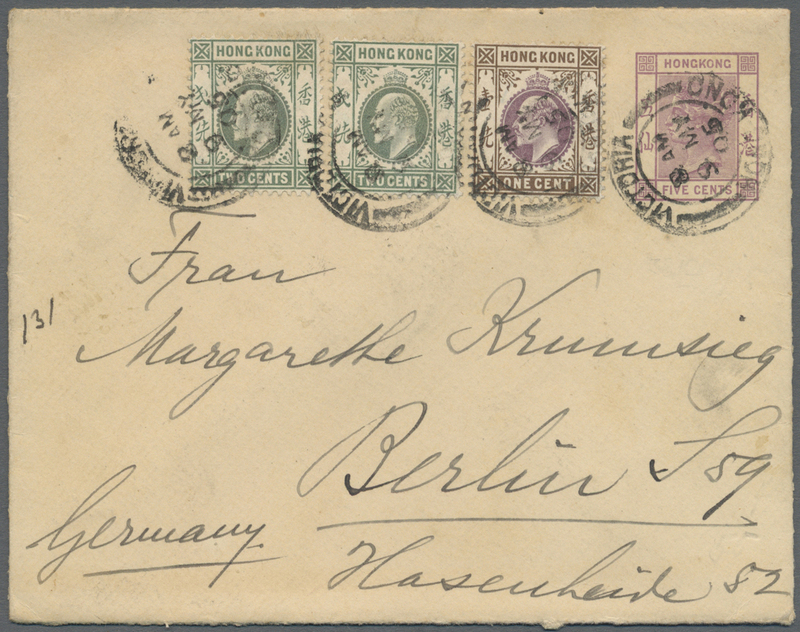 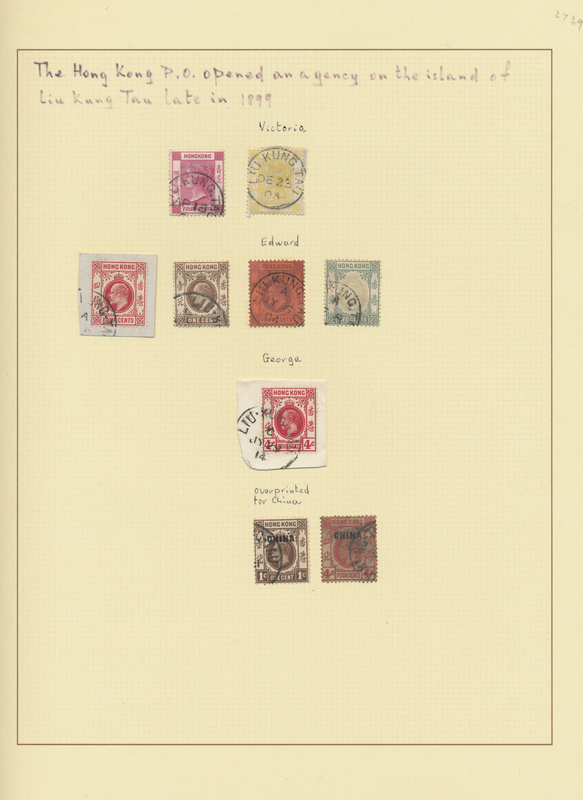 7750 gestempelt (marked) Ansichtskarte (Picture postcard) Briefstück (on piece) Weihaiwei/Liu Kung Tau, 1900/30, QV/KGV study of postmarks on five pages inc. on piece, ppc (3) and two fiscals. 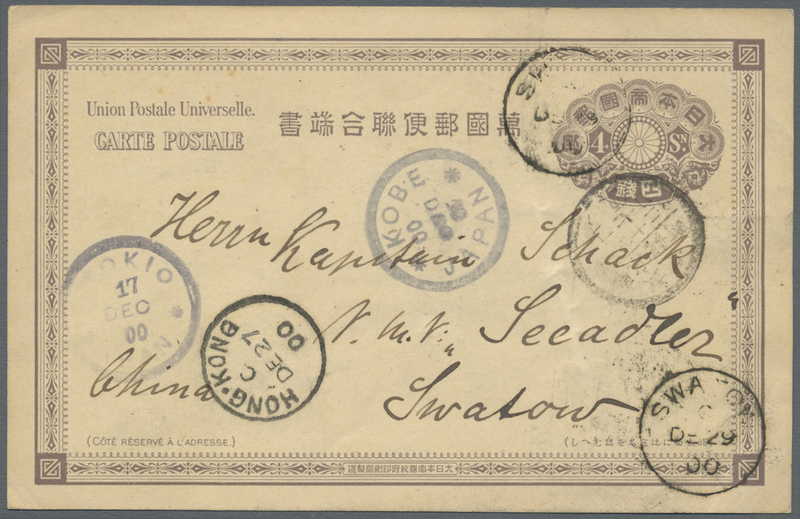 7751 Ganzsache (Complete) Swatow: 1900, Japan UPU card 4 S. used Tokyo branch p.o. 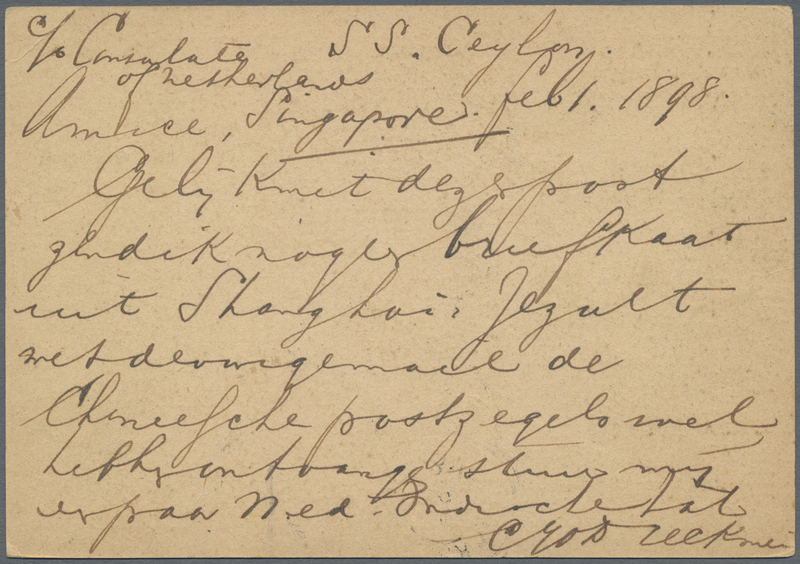 vernacular via "TOKIO 17 DEC 00" to german gunboat "SMS Seeadler" at Swatow, transits Kobe Dec. 19 and Hong Kong Dec. 27, two arrivals "SWATOW DE 29 00". 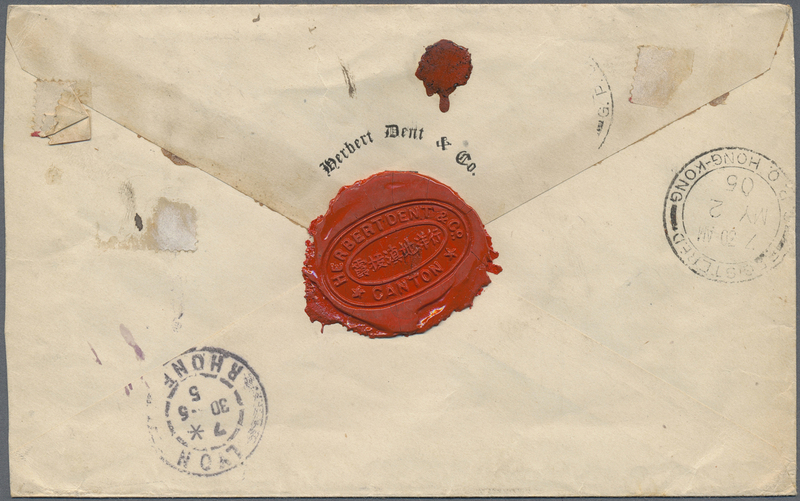 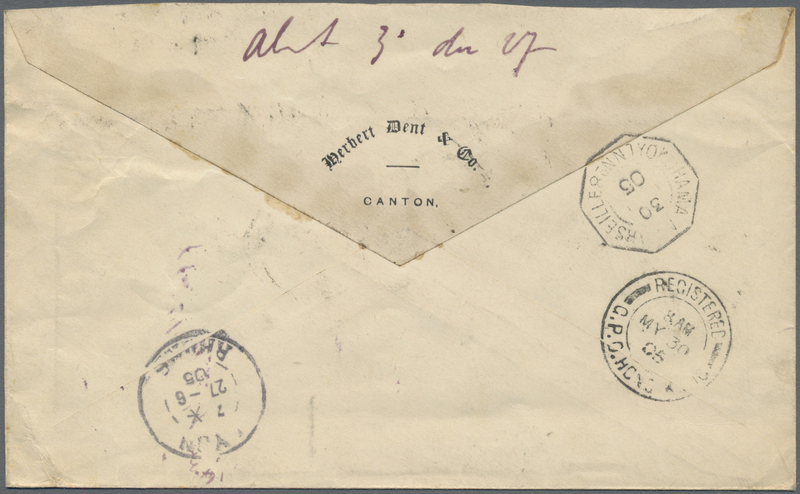 7754 Brief (cover) Canton: 1902, KEVII 4 C. lilac on red (3, one creased) tied "CANTON OC 12 04" to triple weight cover endorsed "Pr. 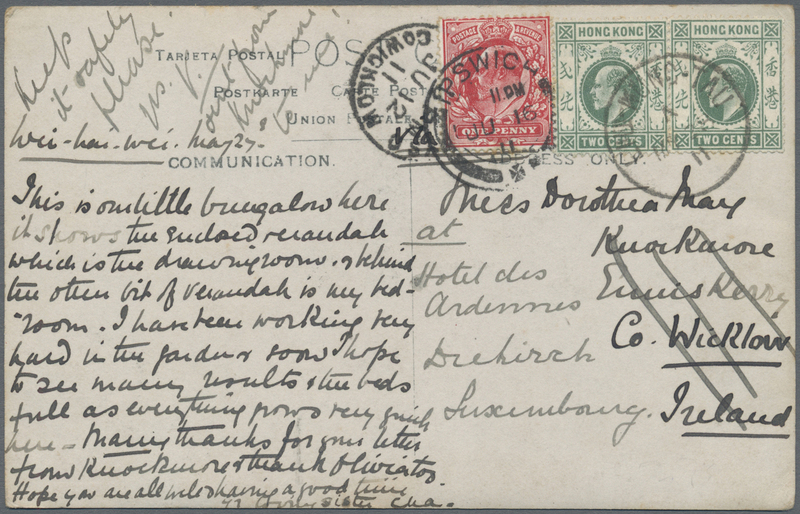 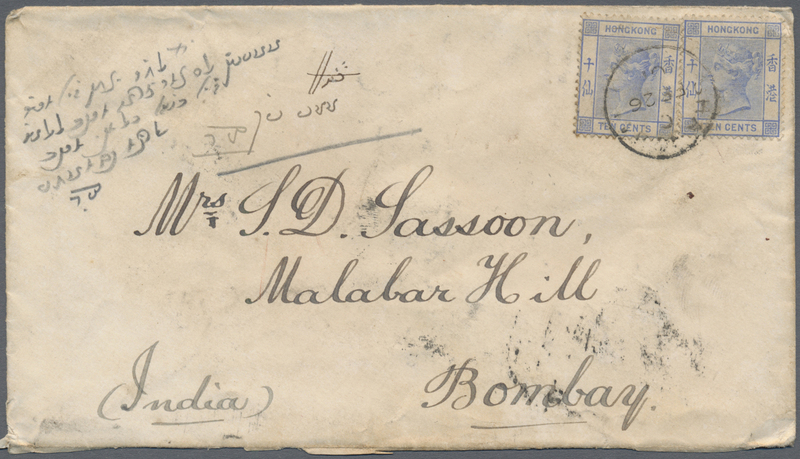 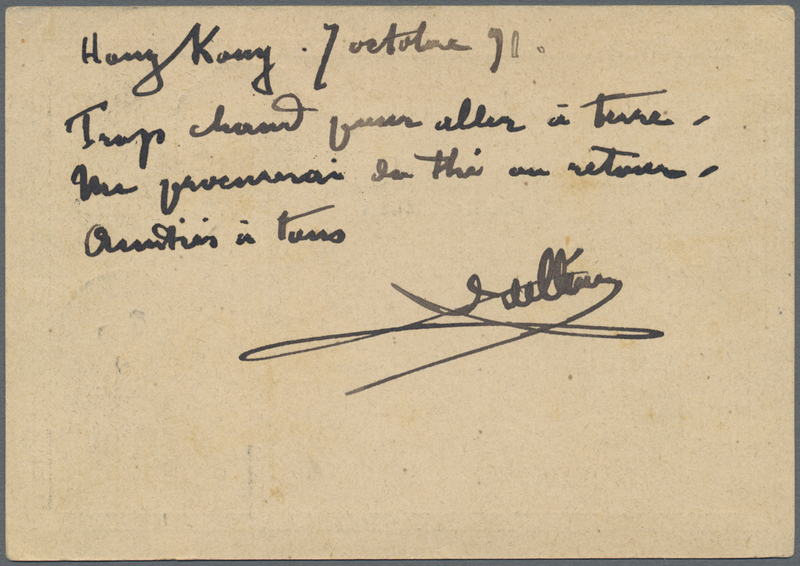 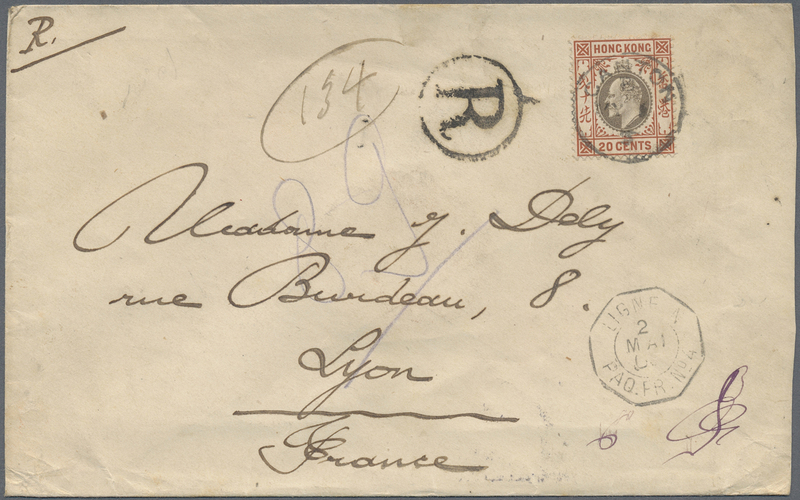 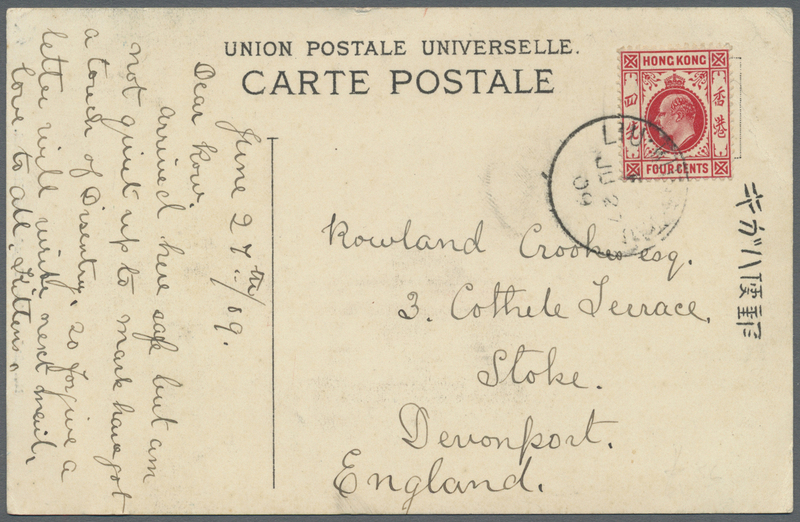 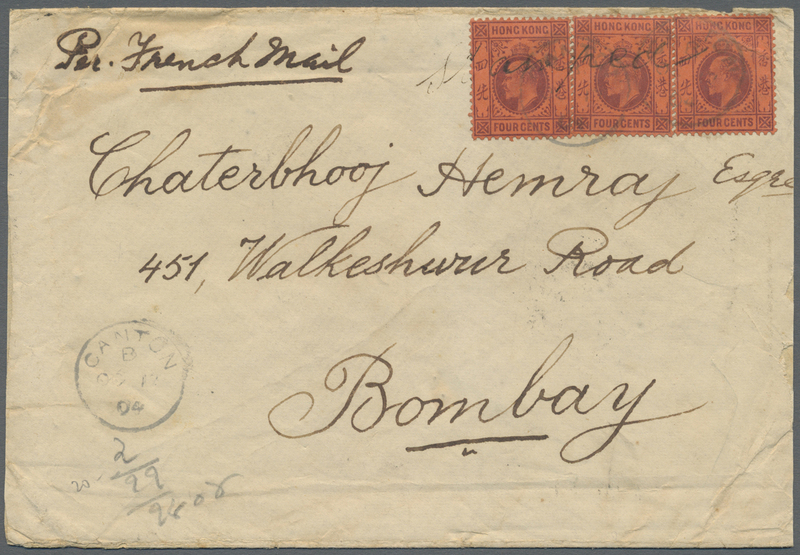 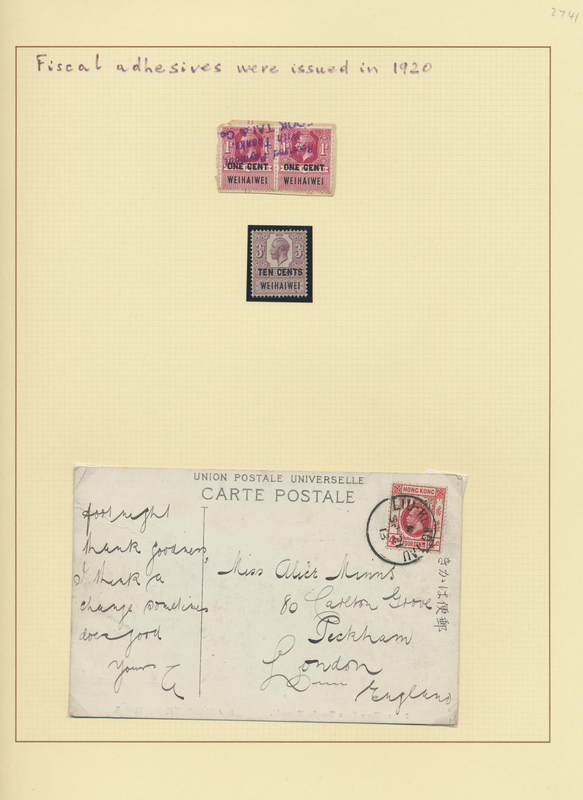 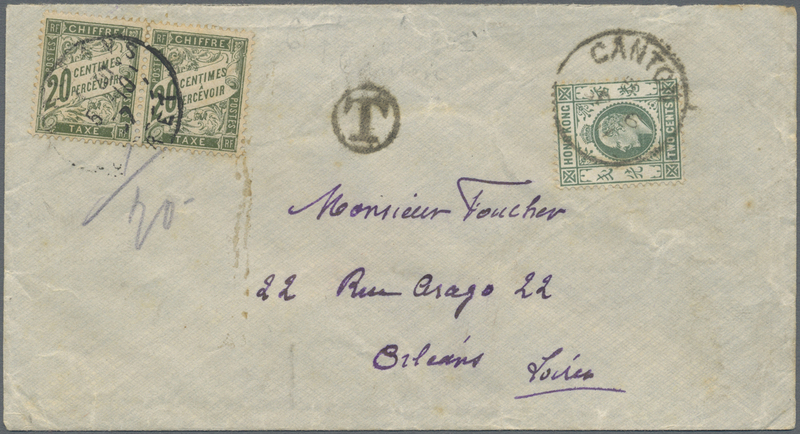 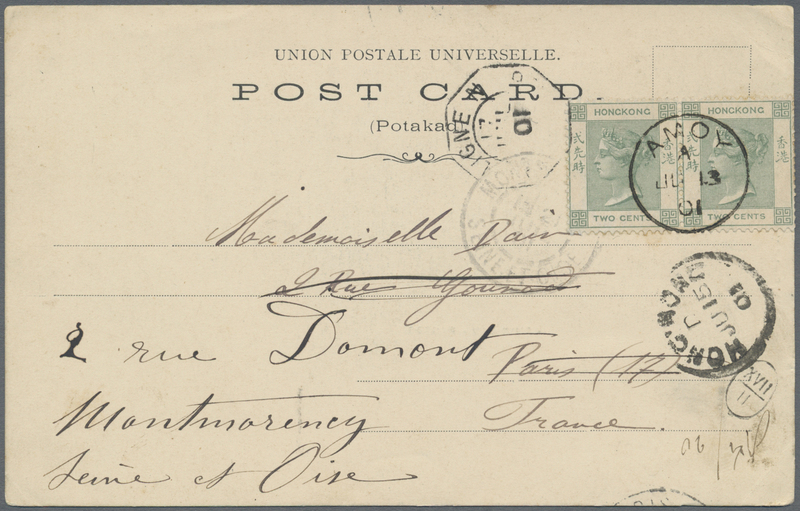 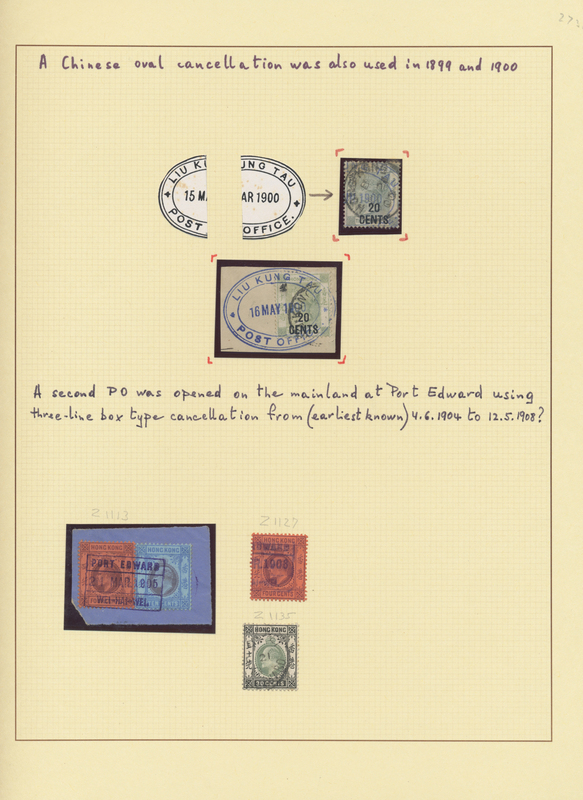 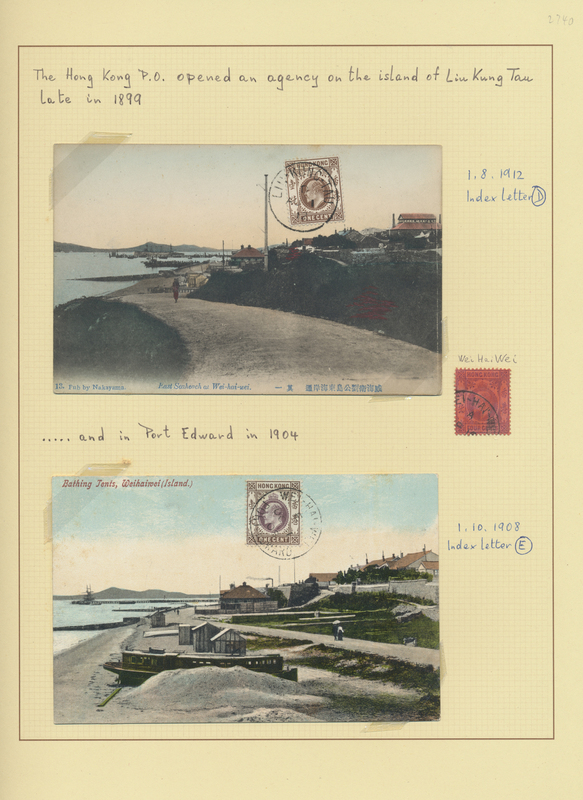 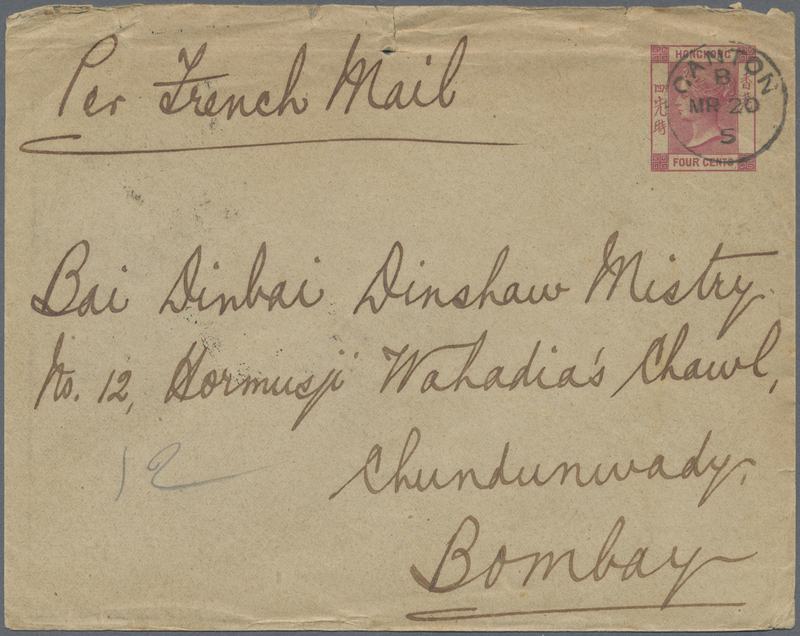 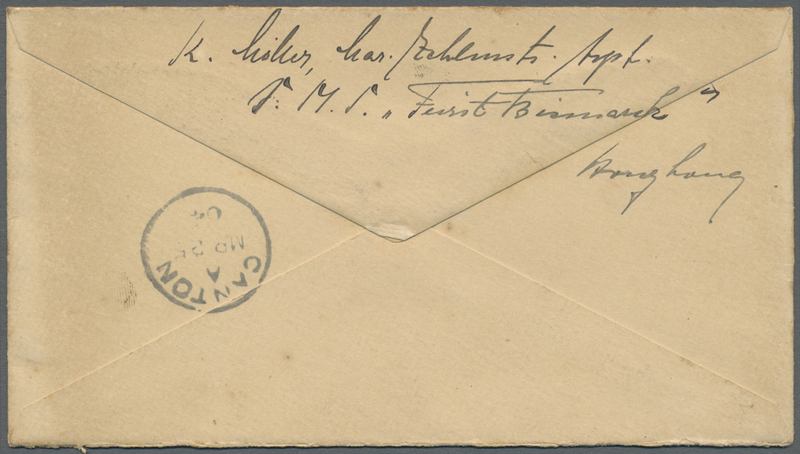 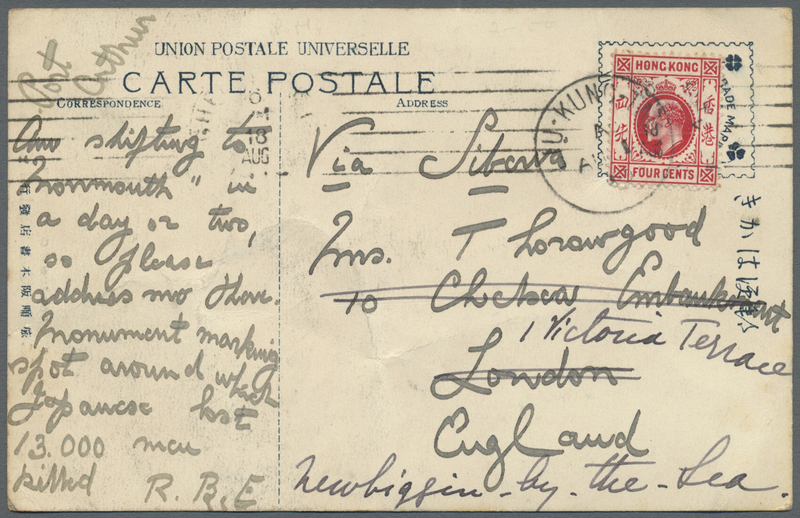 French Mail" to Bombay/India, on reverse transits Hong Kong, Tuticorin and "(Mal)abar Hill 2 NO 04" arrival. 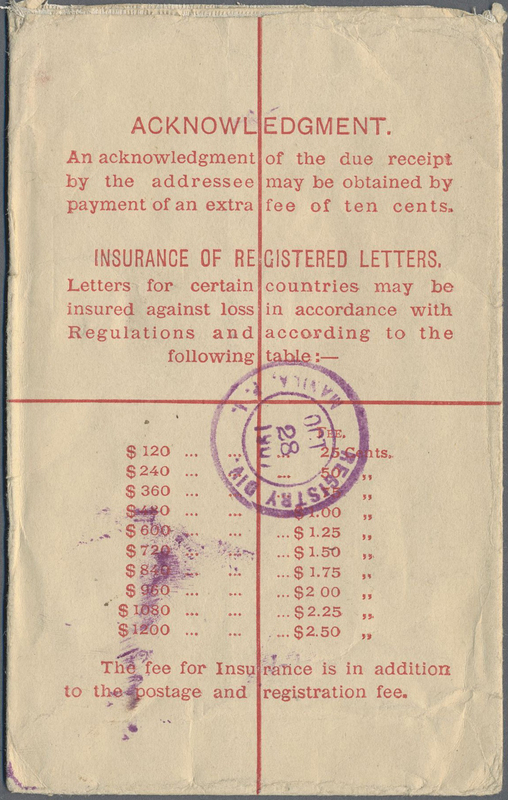 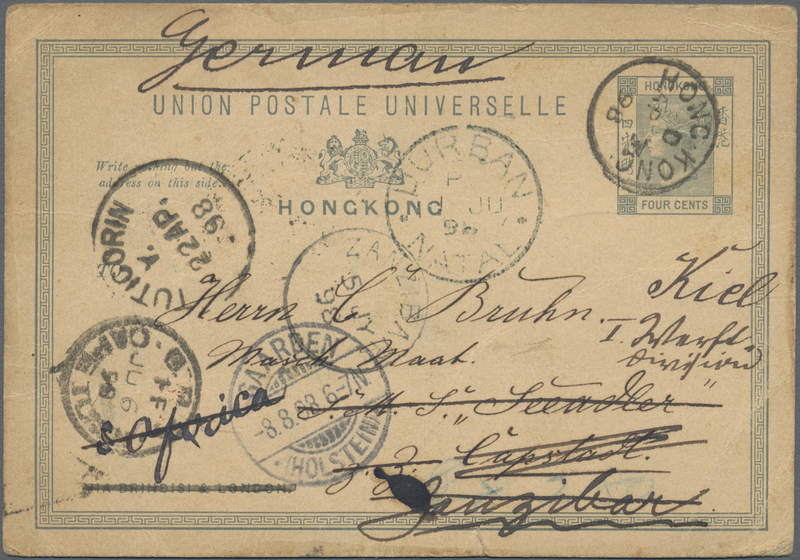 7755 gestempelt (marked) Briefstück (on piece) Chefoo/Tientsin 1903/22, QV-KGV study of postmarks on one page each: Chefoo from 1903 inc. KGV $3 full strike or ppc used to Sydney/Australia; resp. 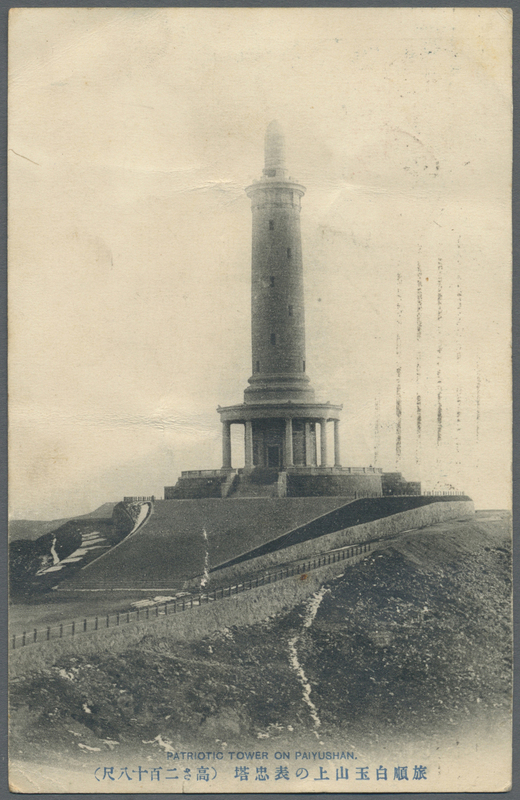 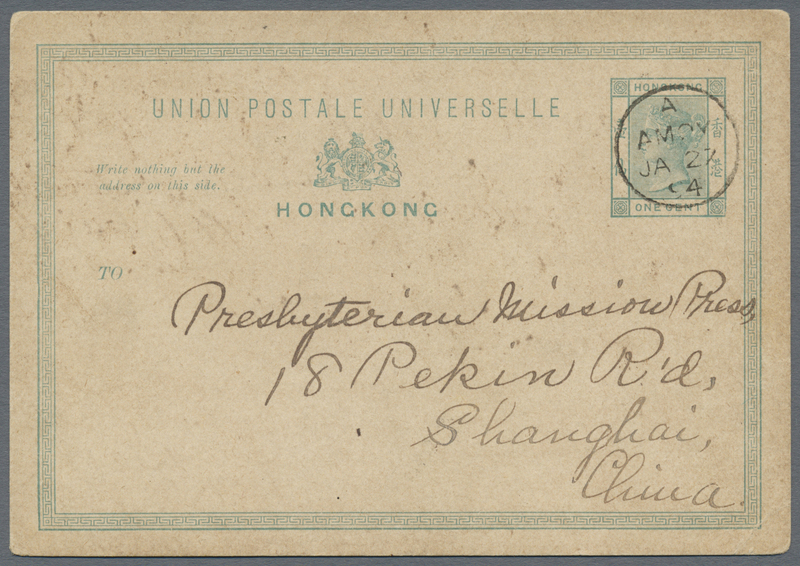 Tientsin 1906/22, same, inc. KEVII on piece. 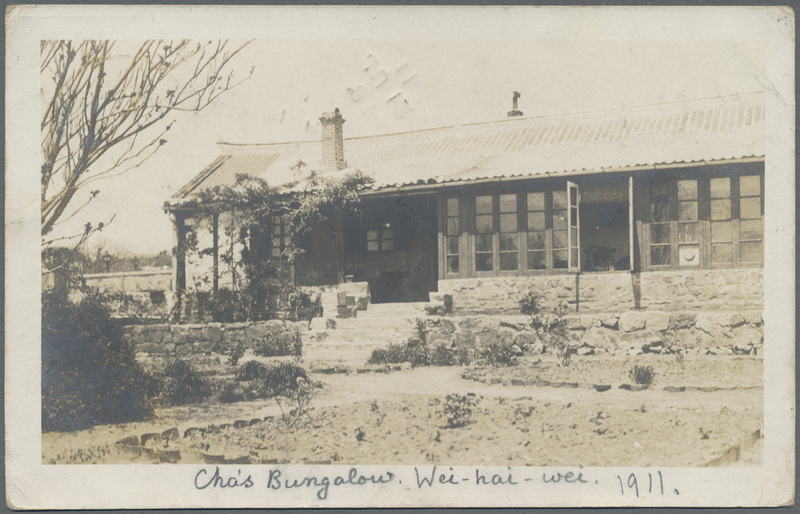 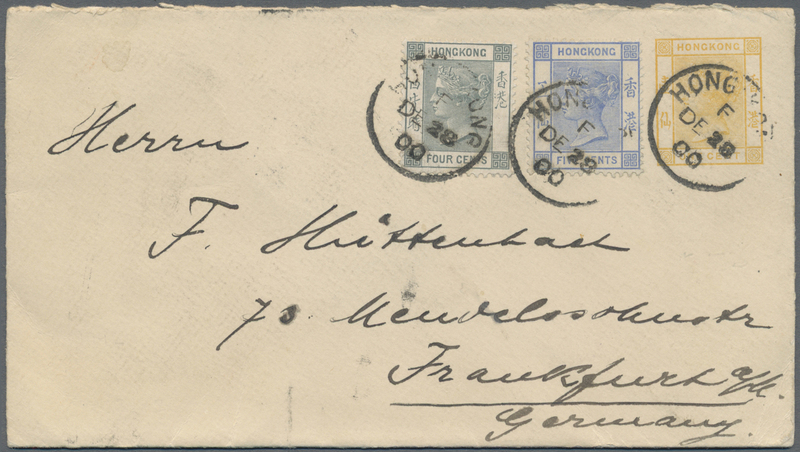 7765 Ansichtskarte (Picture postcard) 92 Wei Hai Wei: 1907, KEVII 4 C. tied "LIU.KUNG.TAU A AU 1 10" to ppc to England and fwd. 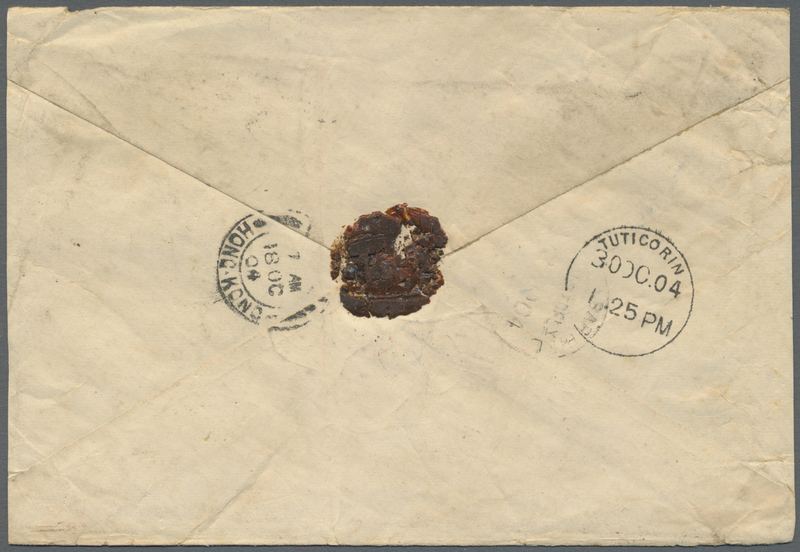 internal. 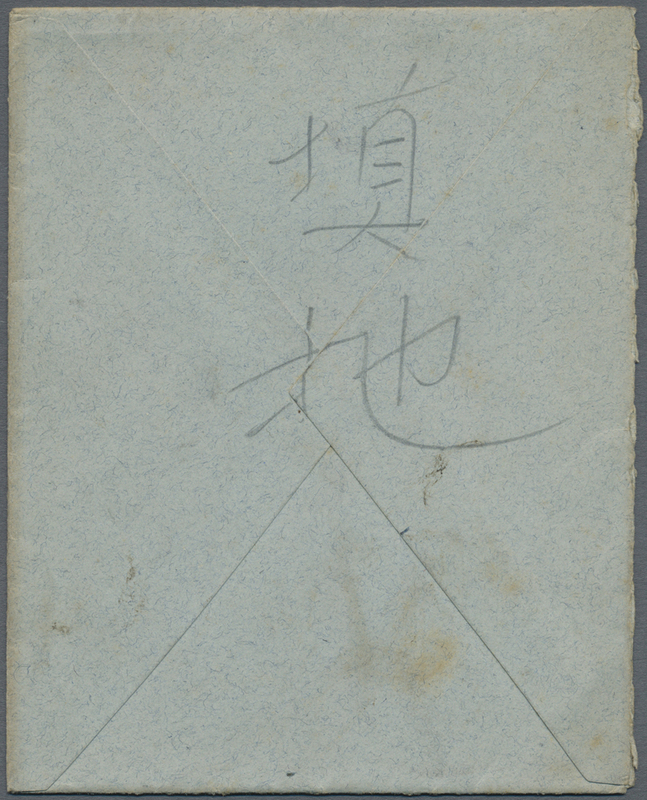 Plus same, but "LIU.KUNG.TAU F JU 27 09". 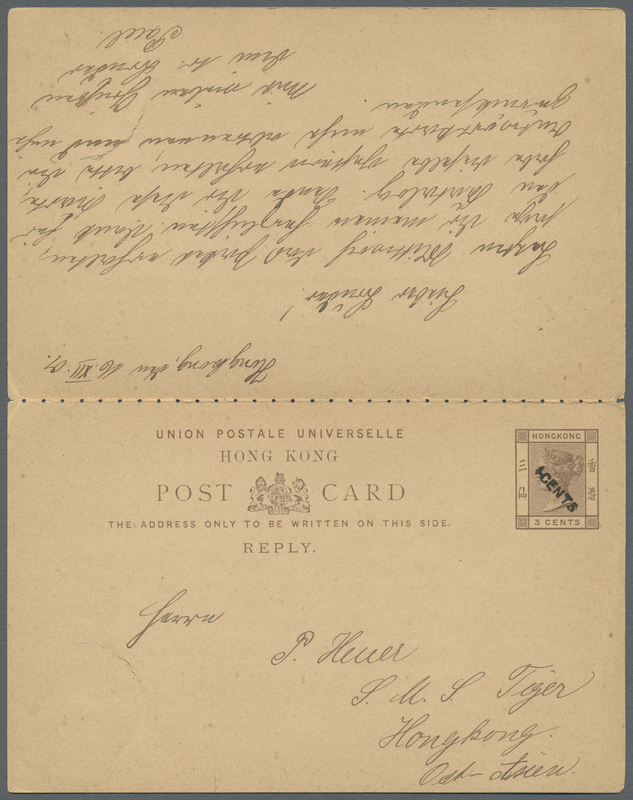 Two ppc. 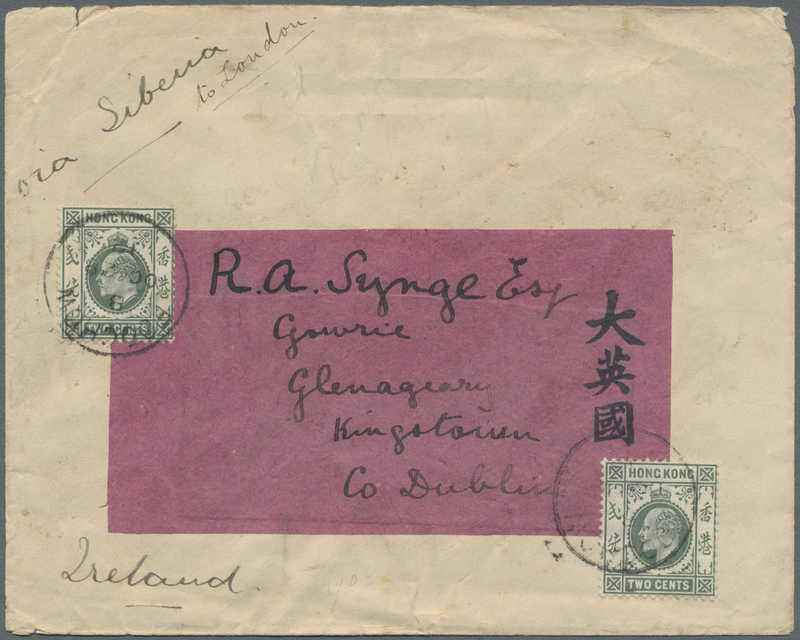 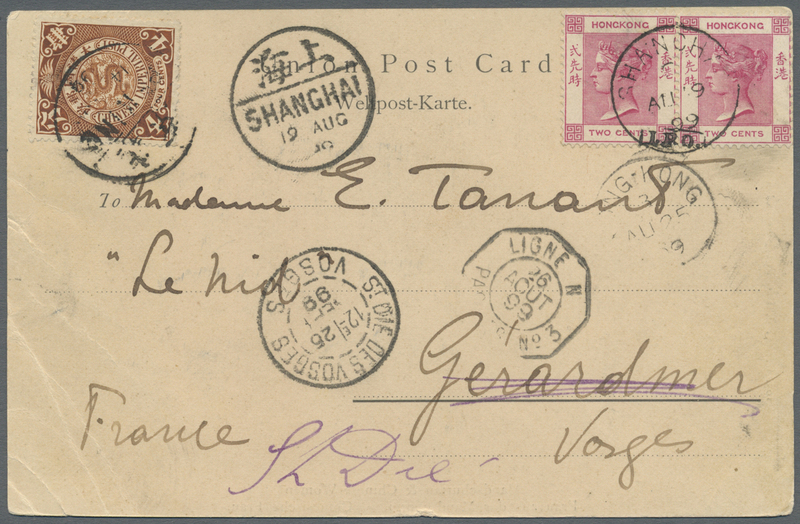 7766 Brief (cover) Shanghai: 1907, KEVII 2 C., 12 C. tied oval "REGISTERED SHANGHAI B.P.O. 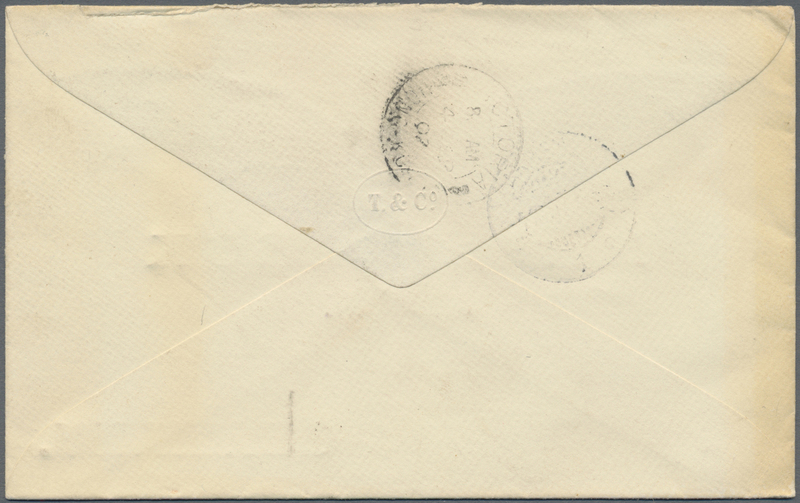 JY 31 12" to reg. 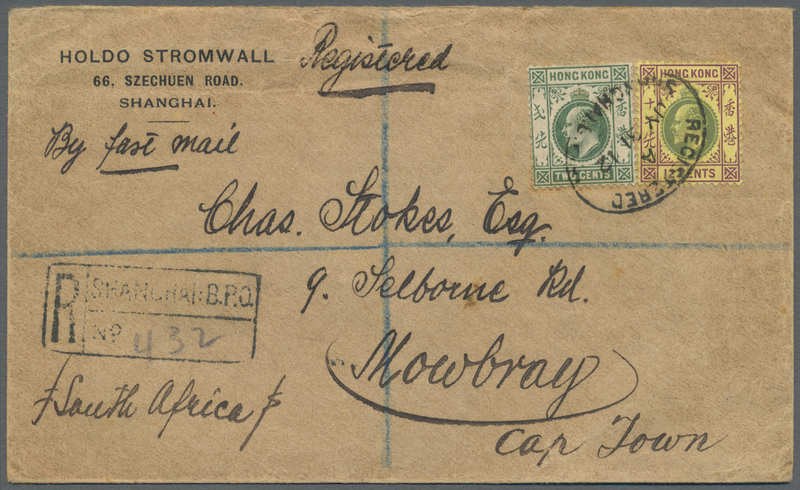 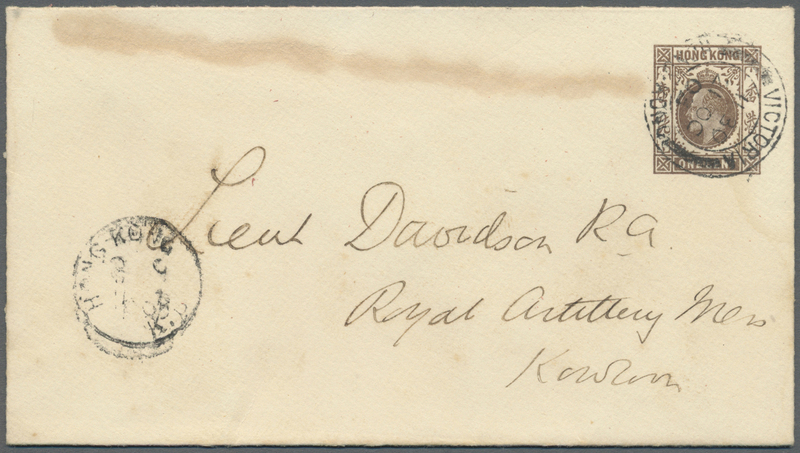 cover to Mowbray/Cape Town, South Africa, backstamps "REGISTERED LONDON", "REGISTERED CAPE TOWN" and arrival SP 10 12"
7769 Ganzsache (Complete) 1888, card QV 1 C. uprated QV 2 C. rose (this with blue oval framed security chop of ?Meyer & Co.) tied "HONG KONG B DE 5 88" to Hamburg/Germany, endorsed "Per Thamies" and 7/I 89 arrival. 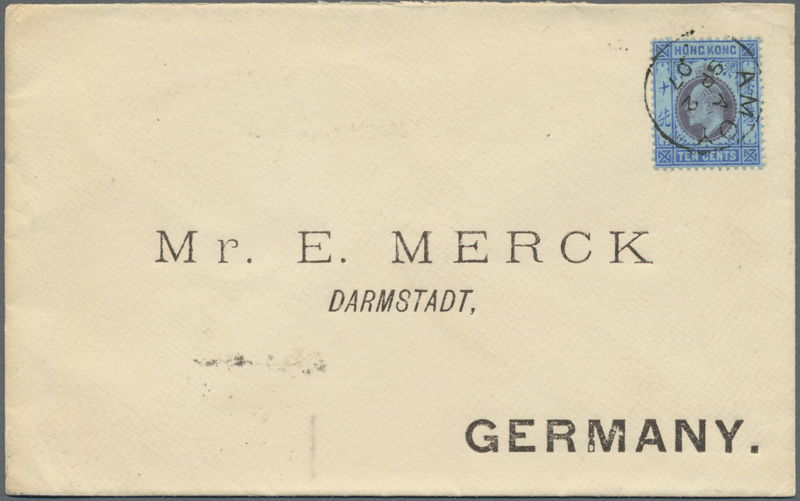 7770 Ganzsache (Complete) H&G 5+7 1893/1899 Postal stationery cards 3c. 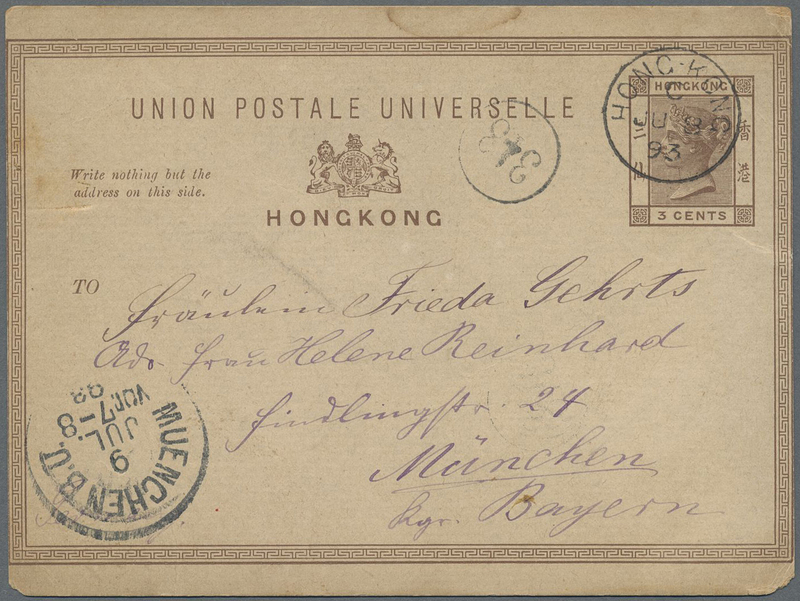 brown, used from Hongkong to Munich, Germany in 1893, with small Hongkong C '8 June 93', Muenchen '9 July 93' and Munich distribution handstamps, and card "ONE/CENT" on 3c. 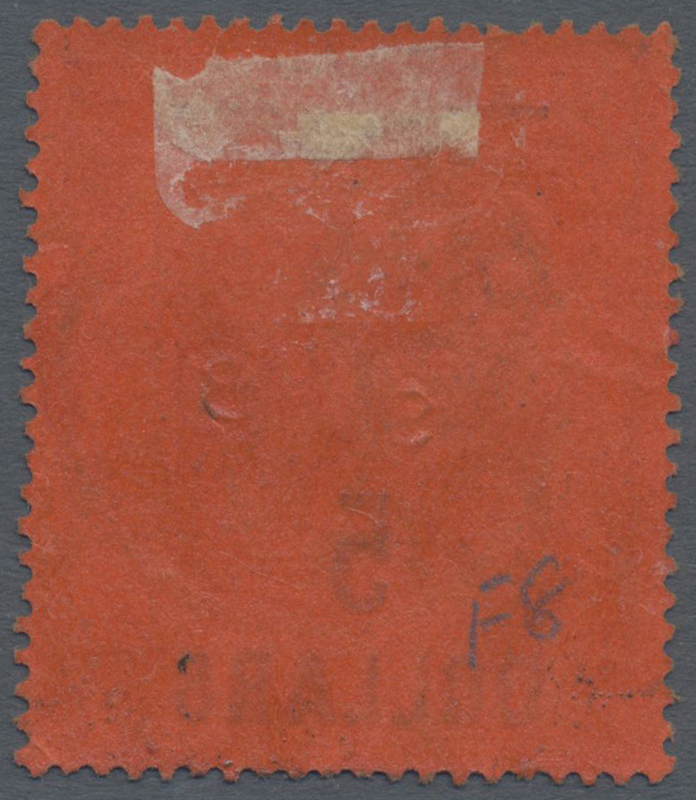 brown used locally with "HONG-KONG/F/DE 29/99" cds. 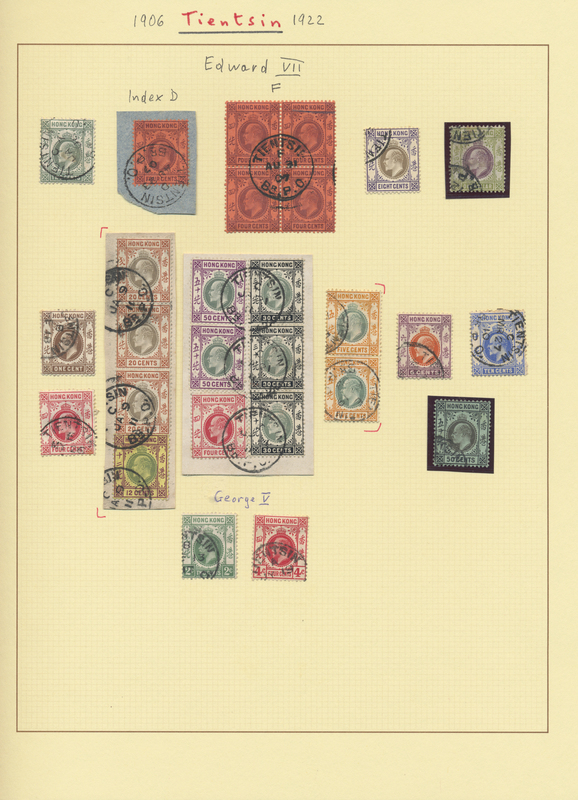 7775 Ganzsache (Complete) U4 etc. 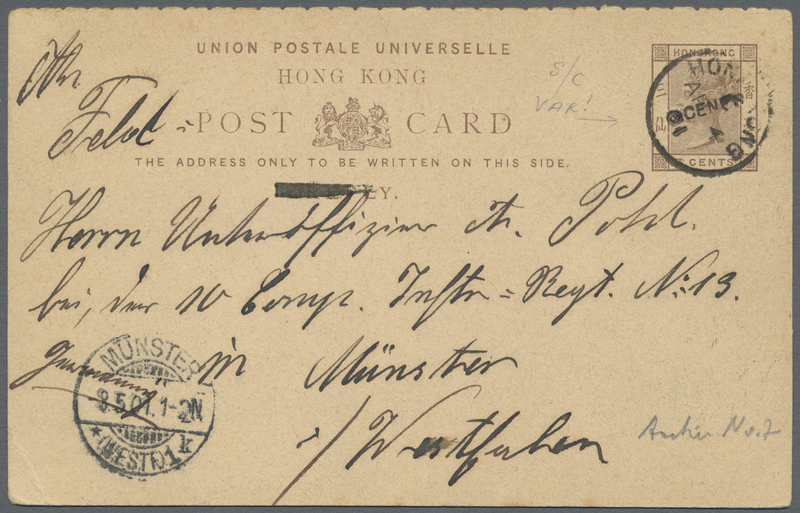 1900, envelope QV 5 C. uprated KEVII 1 C., 2 C. (2) tied four strikes "VICTORIA HONG KONG 9 MY 05"
7777 Ganzsache (Complete) 1901, UPU reply card QV 4 C./3 C+4 C./3 C., surcharge running NW-SE, canc. 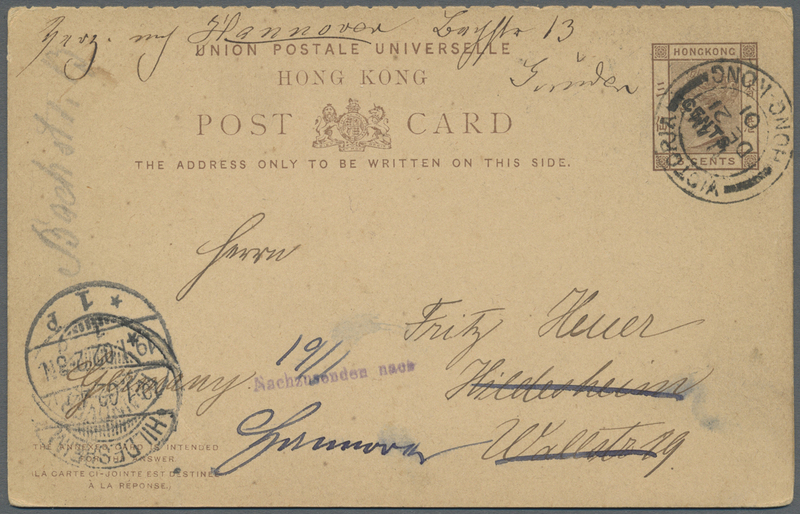 "VICTORIA HONG KONG DE 21 01" to Hildesheim/Germany and fwd. 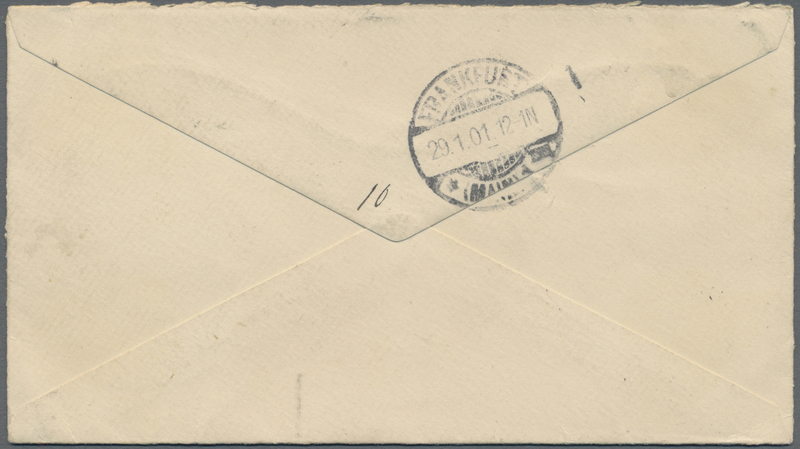 to Hannover, reply part adhering unused. 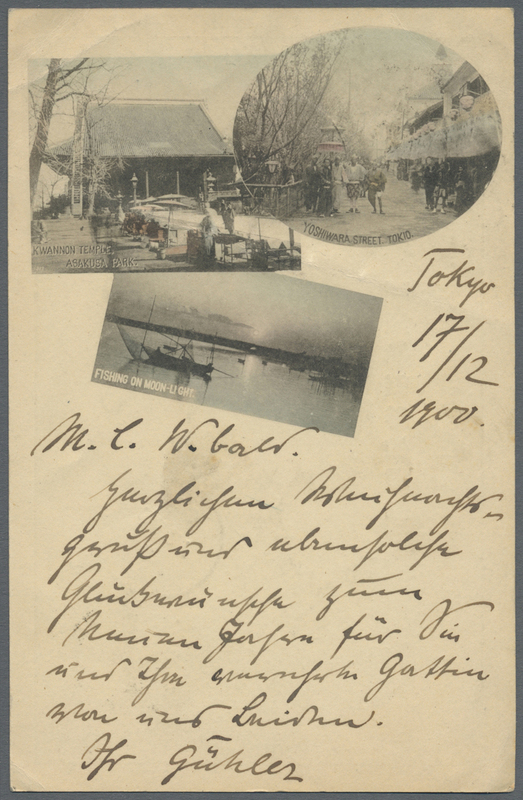 7778 Ganzsache (Complete) 1901, card QV 4 C./3 C. surcharge running SW to NE canc. 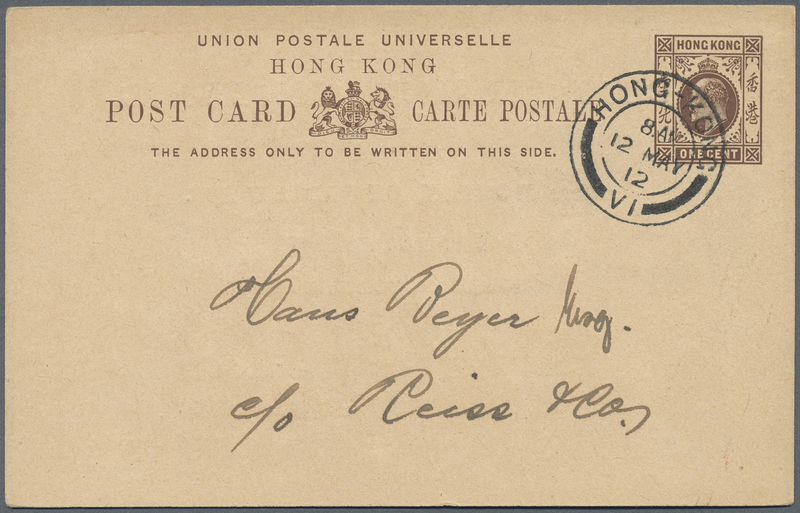 "HONG KONG AP 4 01" to Münster/Germany, Sgt. 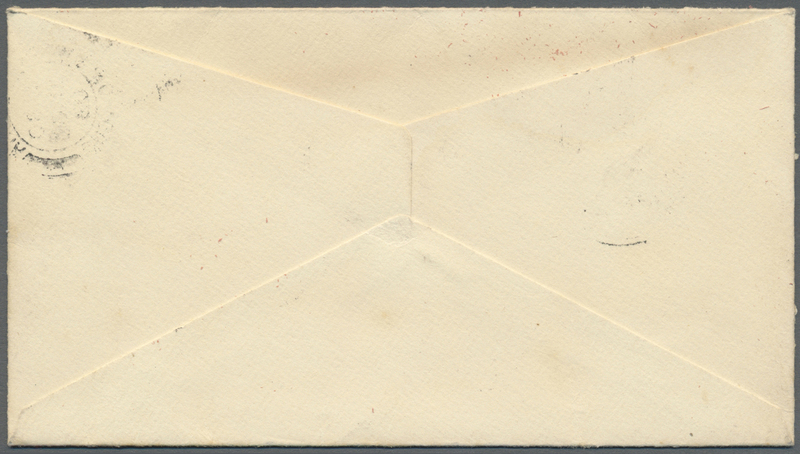 of Infantry Rgt. 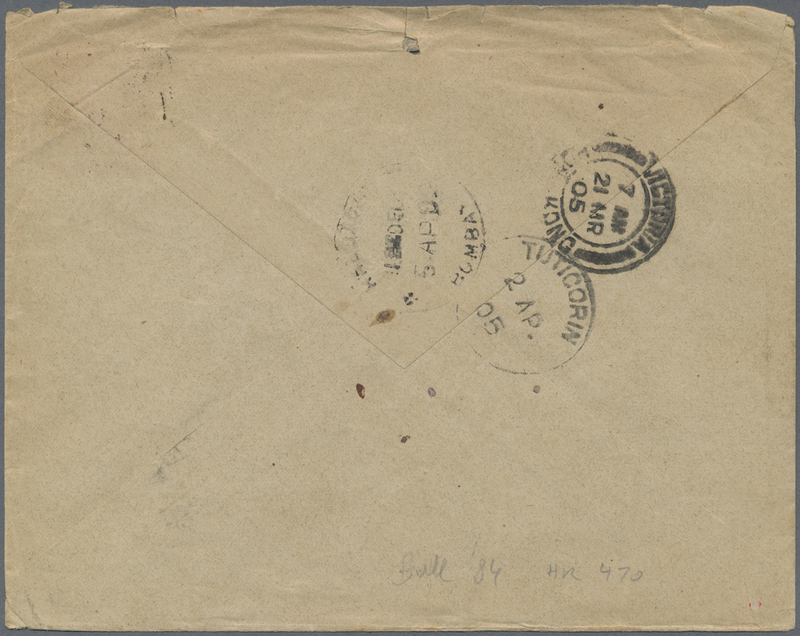 13 10th comp. 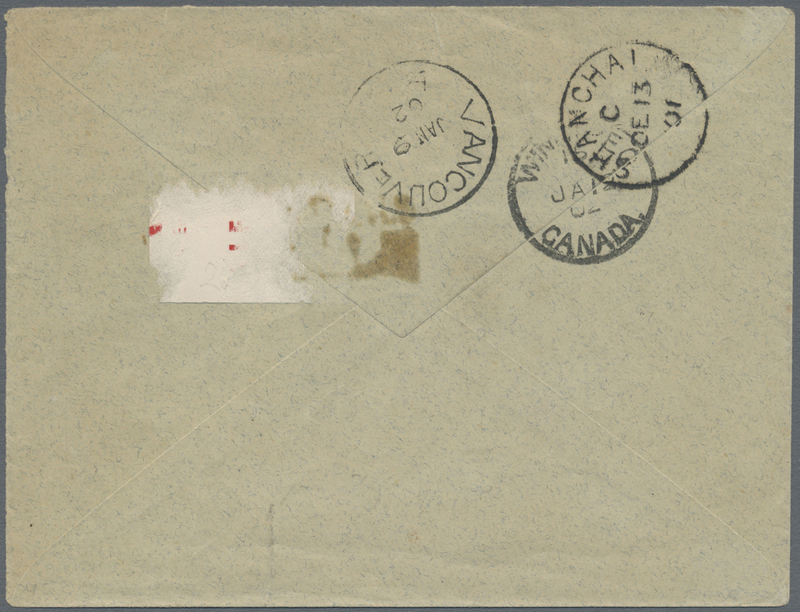 w. May 3 arrival. 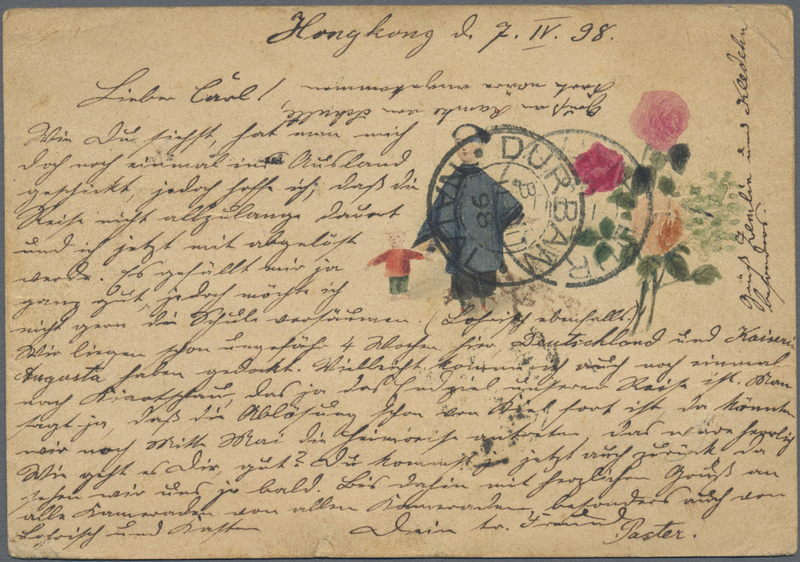 7779 Ganzsache (Complete) U2 etc. 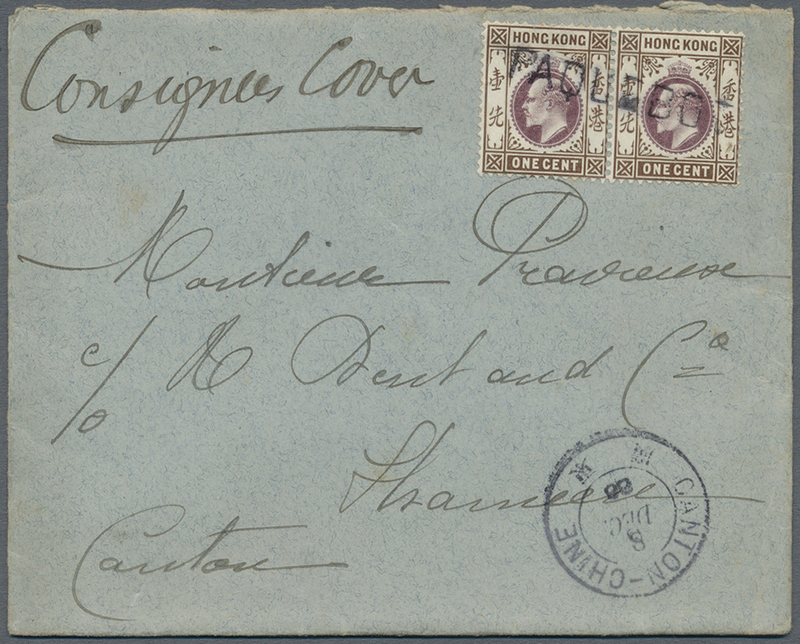 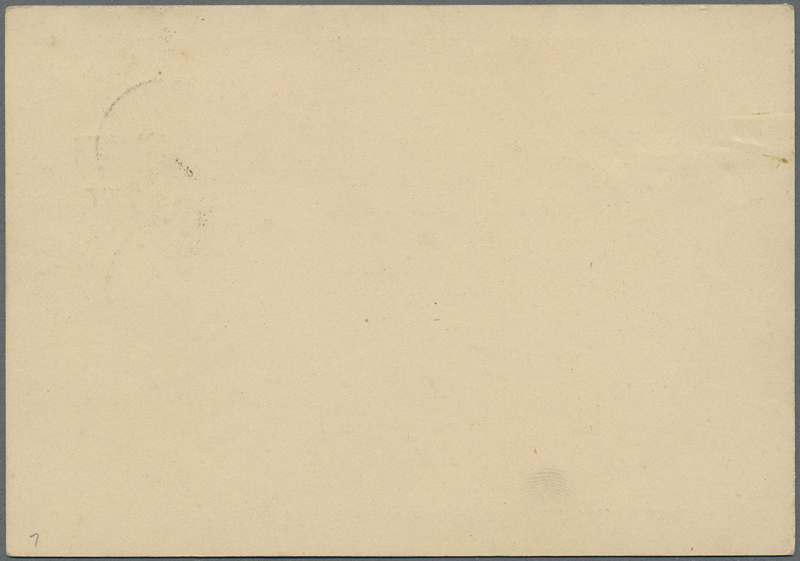 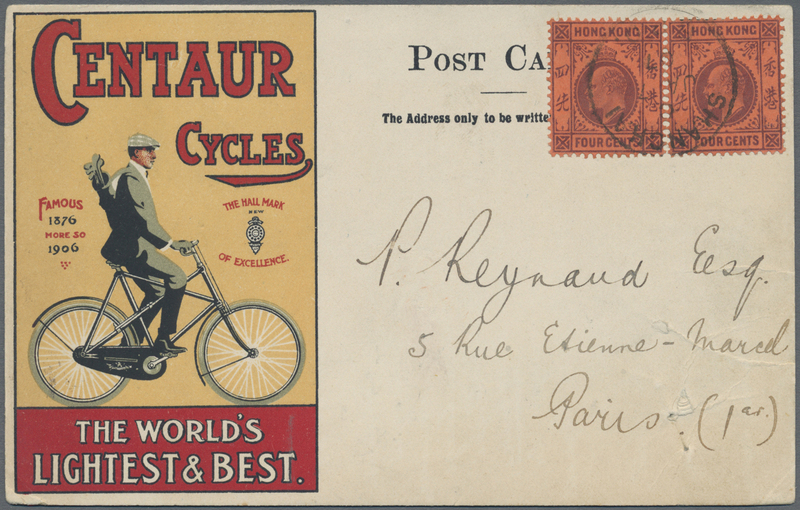 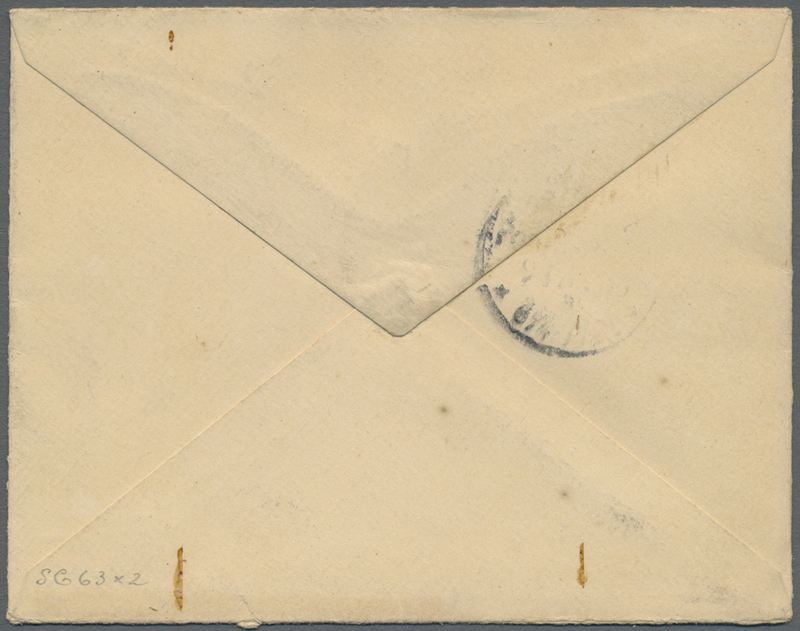 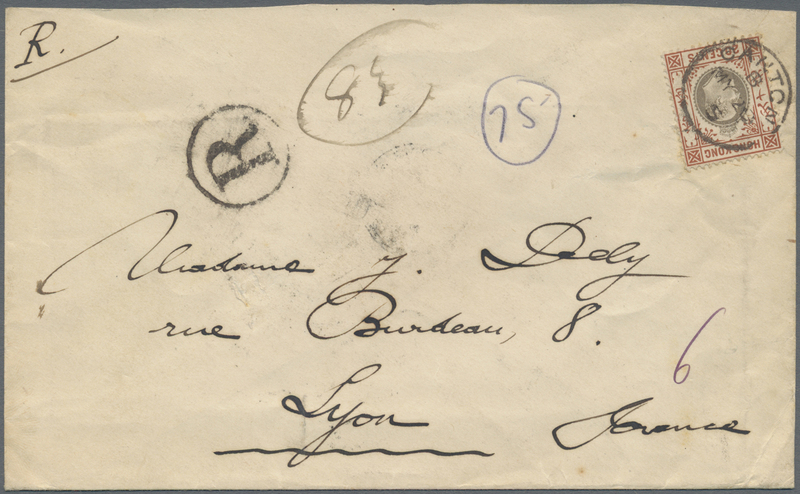 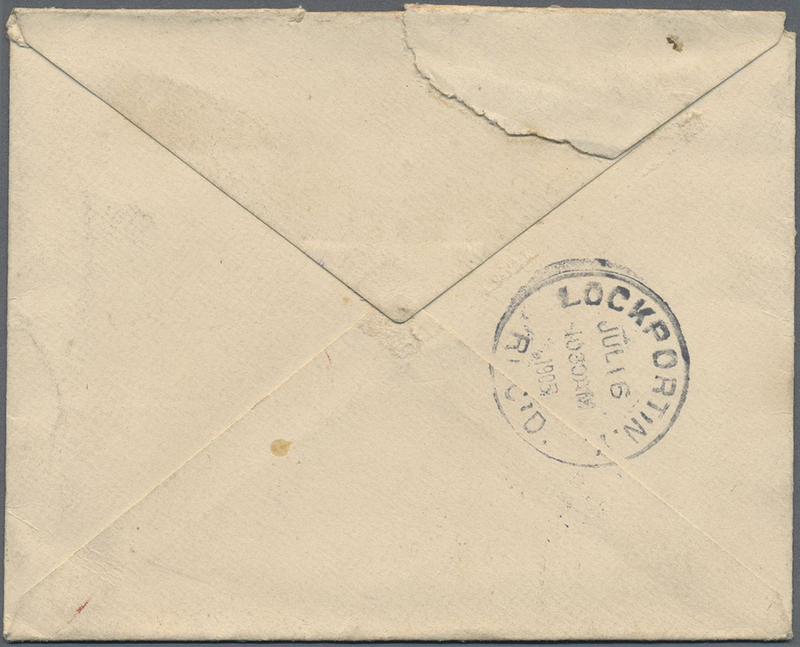 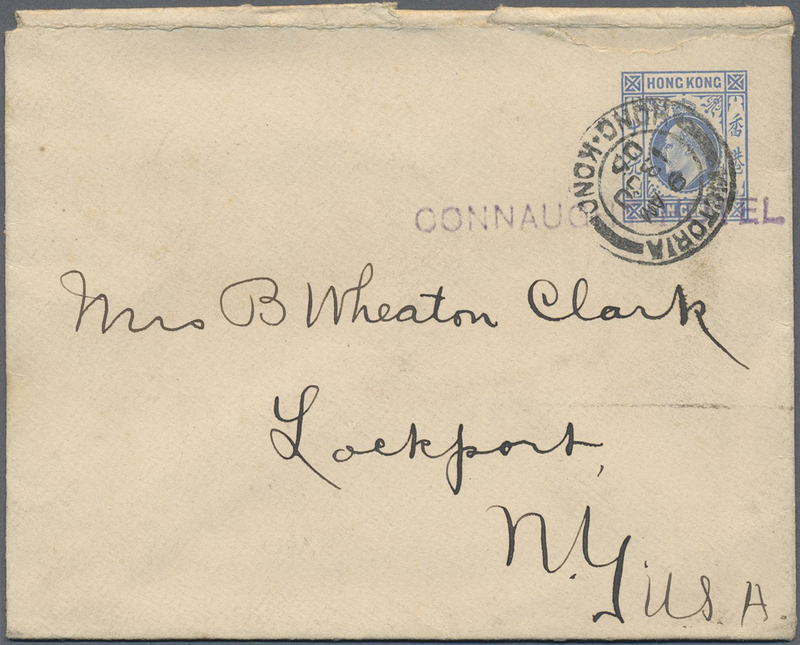 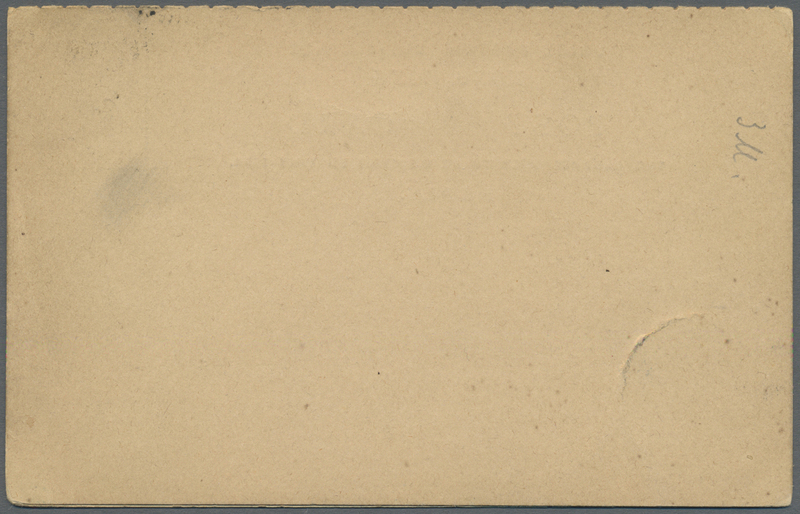 1902, envelope QV 2 C. canc. 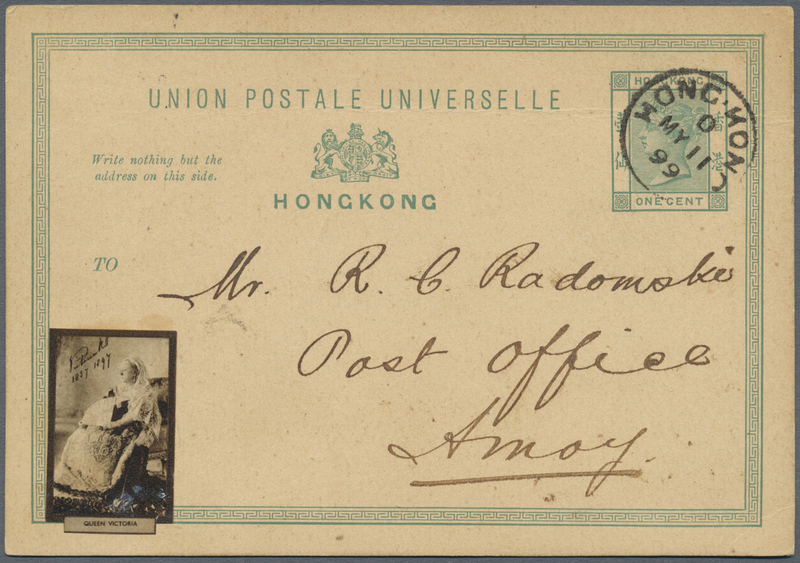 "VICTORIA HONG-KONG 24 MR 04" to Canton w. backstamp "CANTON A NOV 25 04", also mirror image on front. 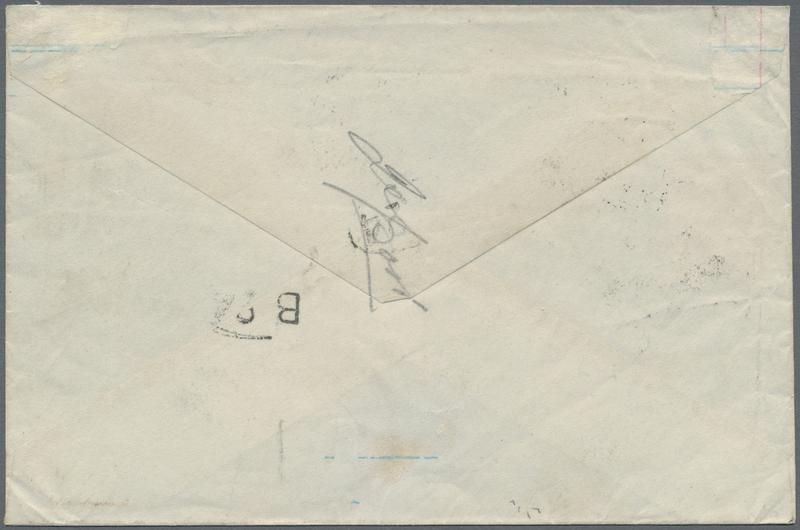 Correct local letter rate. 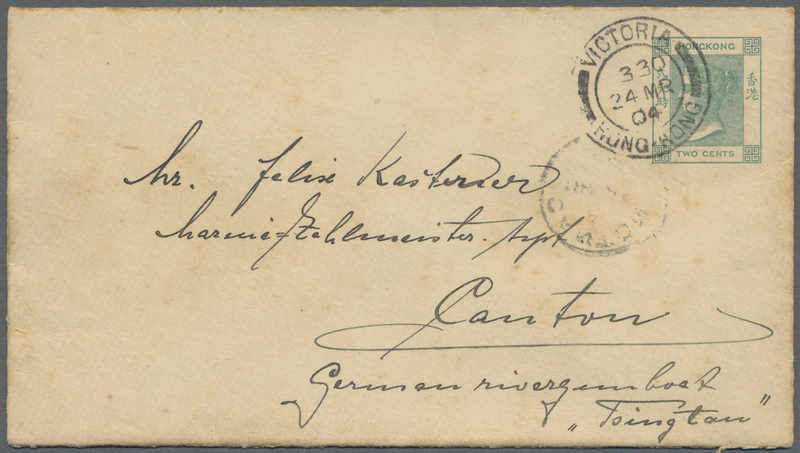 7780 Ganzsache (Complete) 1903, registration envelope KEVII 10 C. uprated KEVII 10 C. canc. 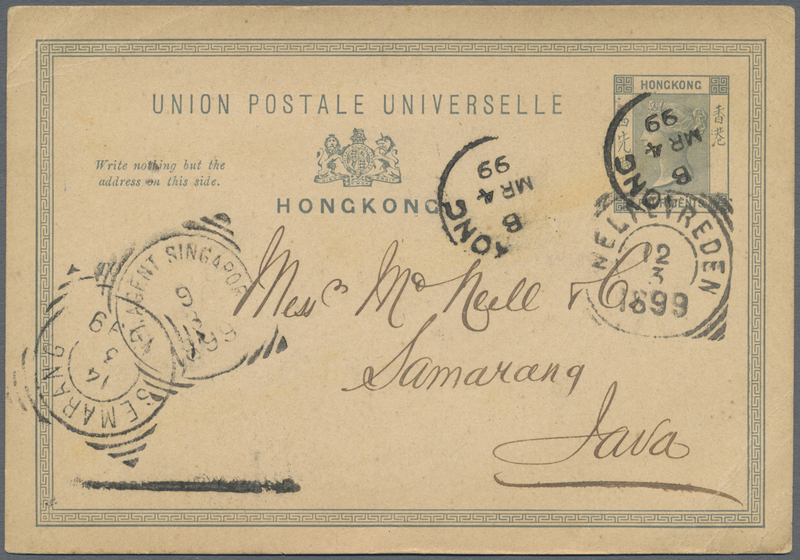 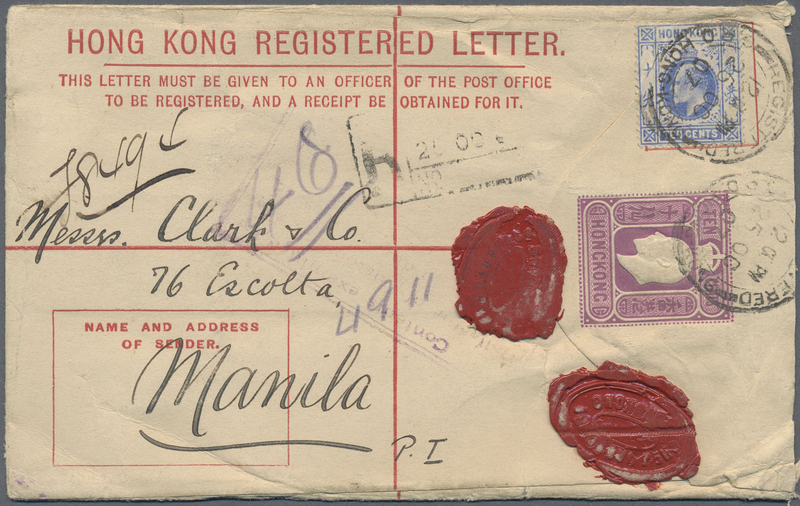 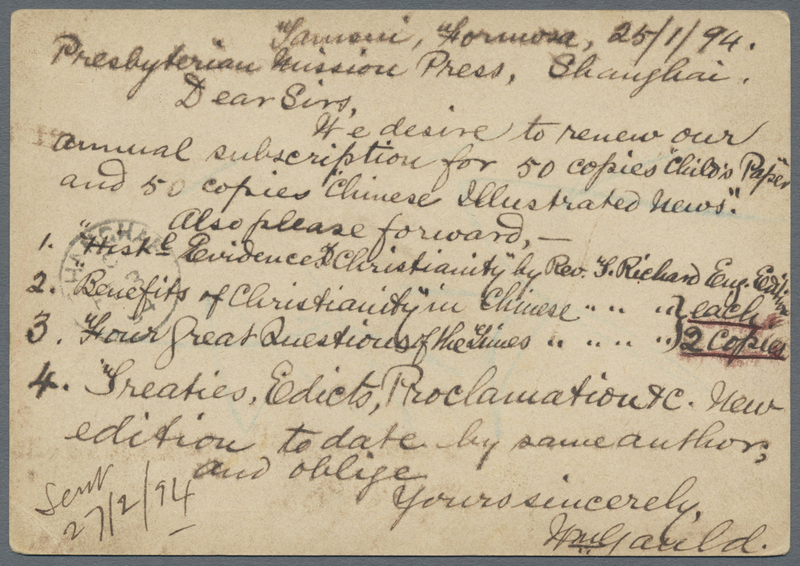 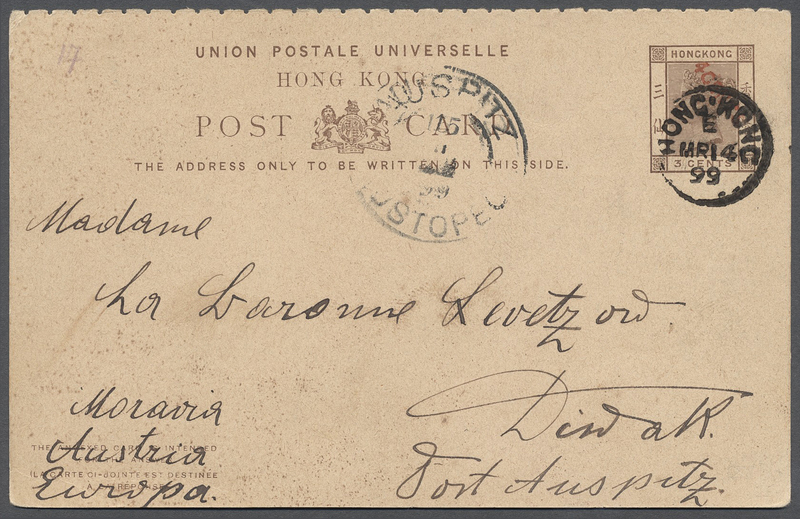 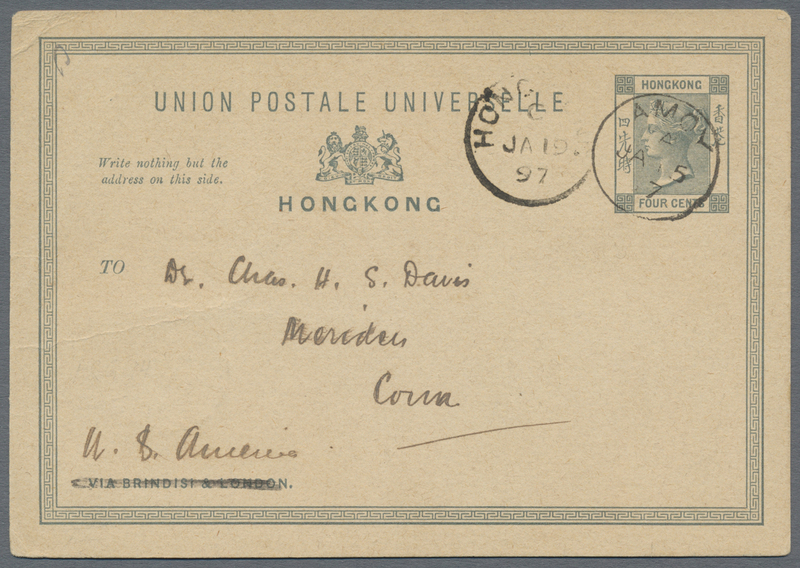 "REGISTERED HONG KONG 25 OC 07“ to Manila/Philippines w. Oct 28 backstamp. 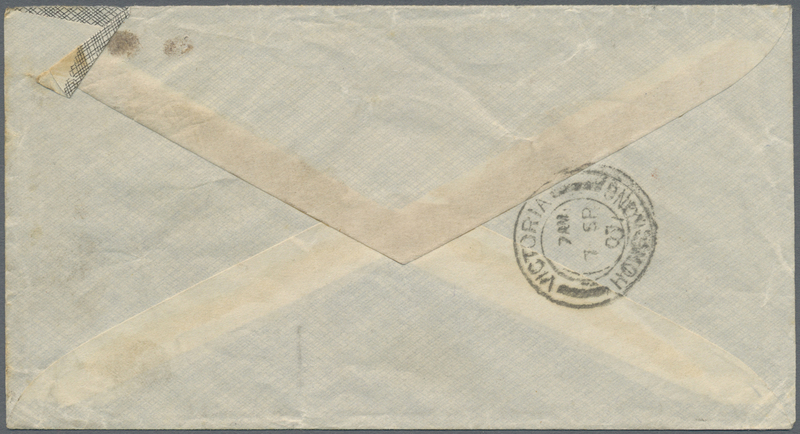 7781 Ganzsache (Complete) 1903, envelope KEVII 10 C. canc. 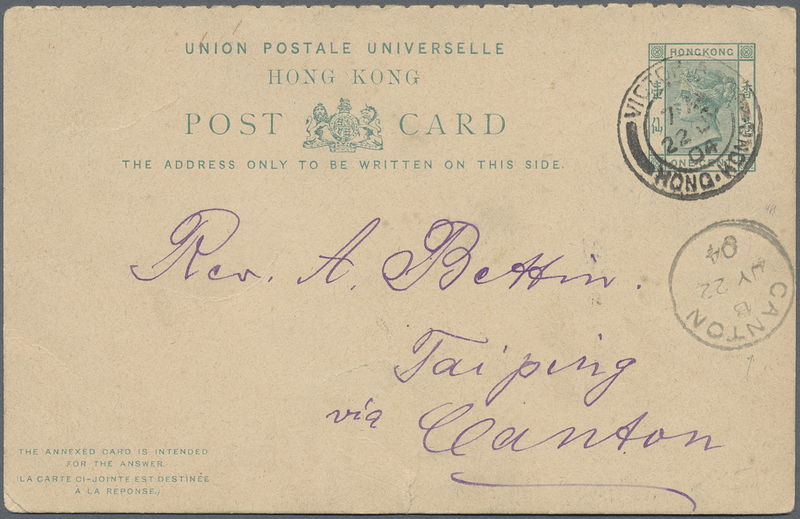 "VICTORIA HONG KONG 13 JU 06“, also security chop s. l. "CONNAUGHT HOTEL“ to Lockport NY/USA w. Jul 16 backstamp, unevenly opened but complete. 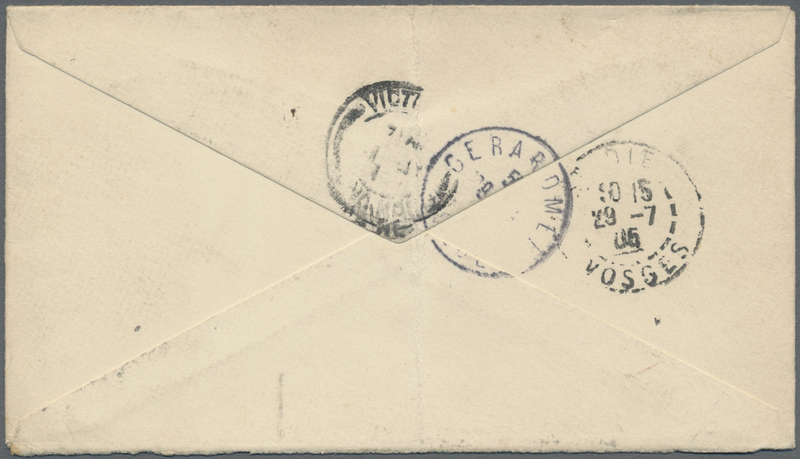 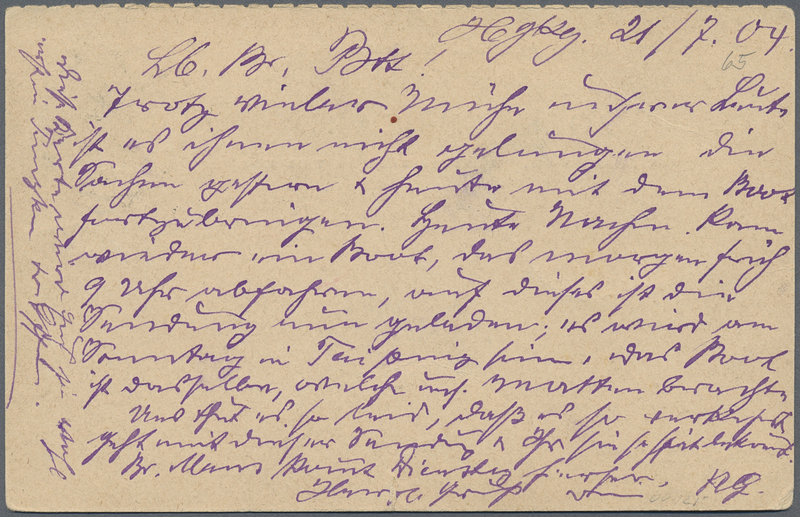 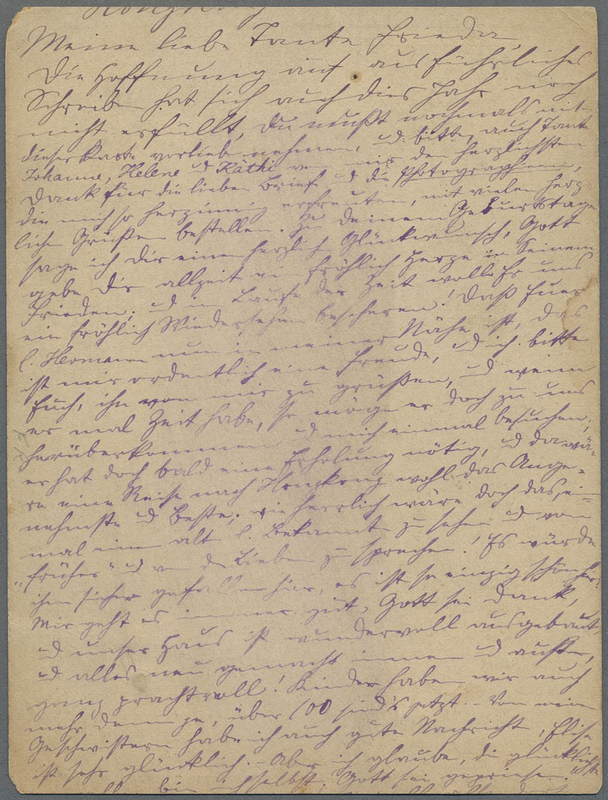 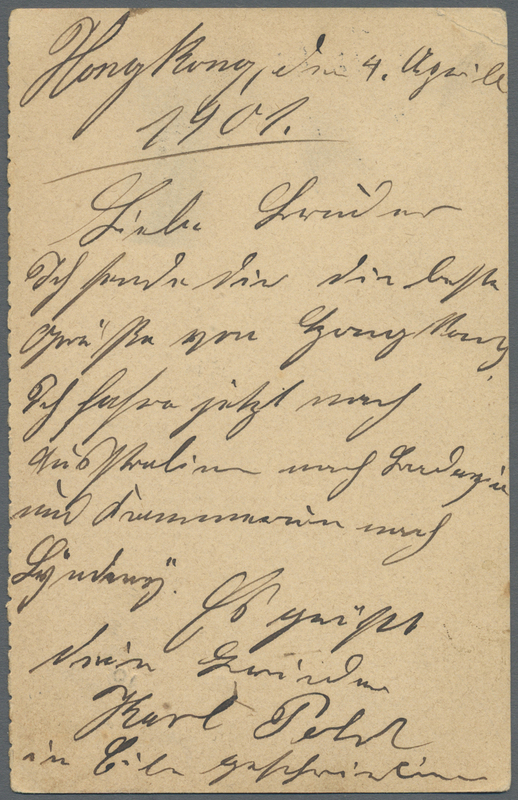 7782 Ganzsache (Complete) 1904/12, card QV 1 C. question part, canc. 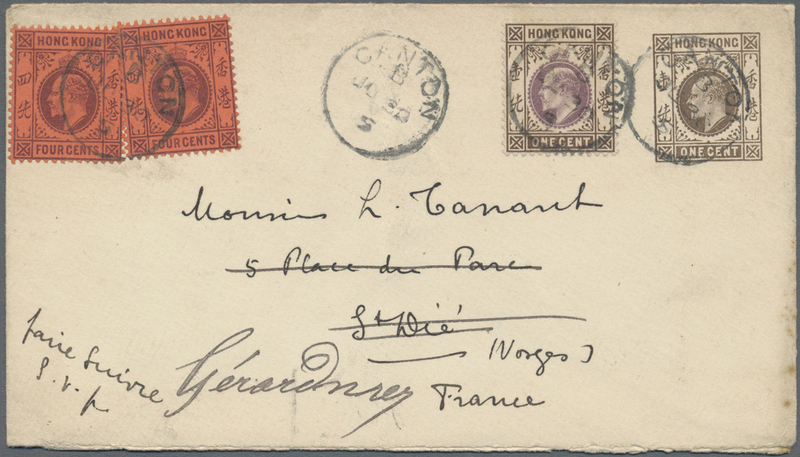 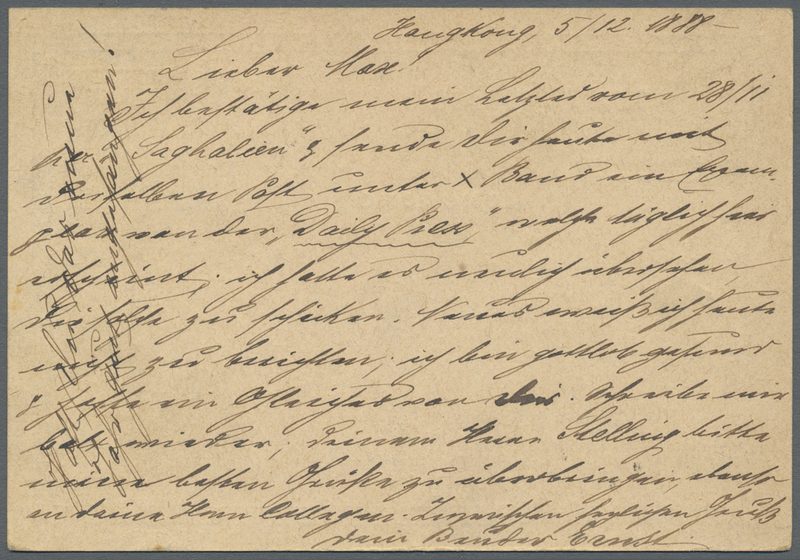 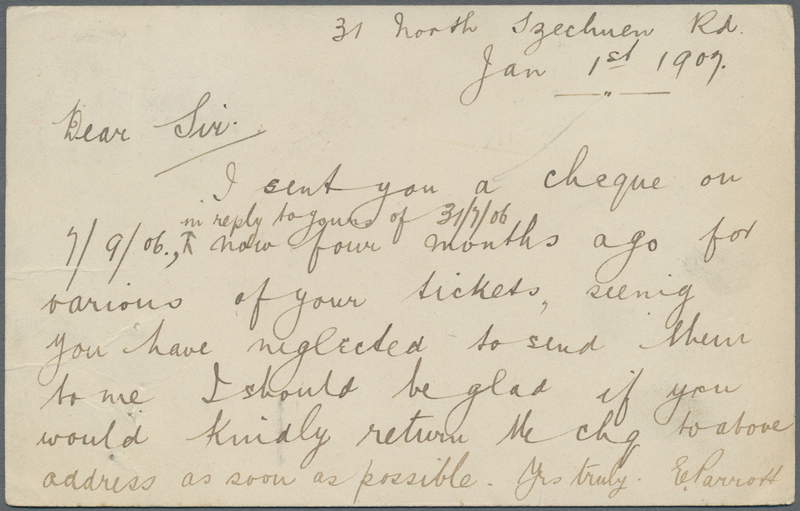 "VICTORIA 22 JY 04" to Taiping via Canton w. transit "CANTON B JY 22 04", bottom 4 mm tear; and card KEVII 1 C. canc. 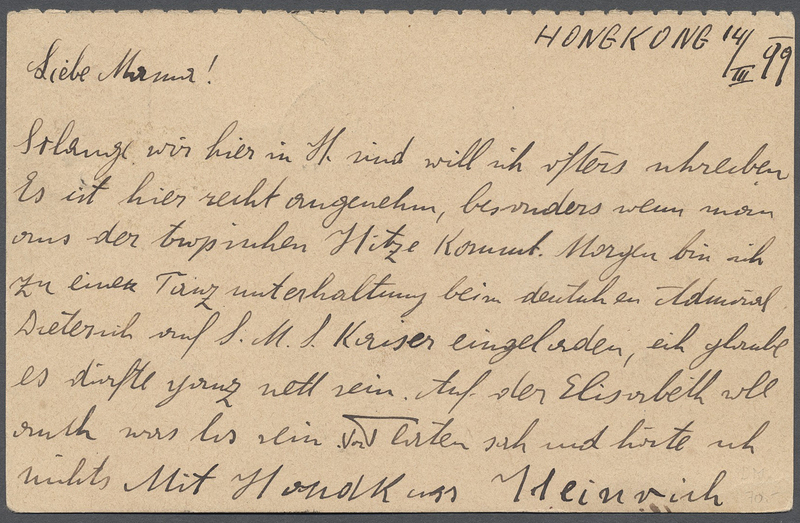 very clear "HONG-KONG VI 12 MAY 12" used local, printed invitation to Club Germany general meeting. 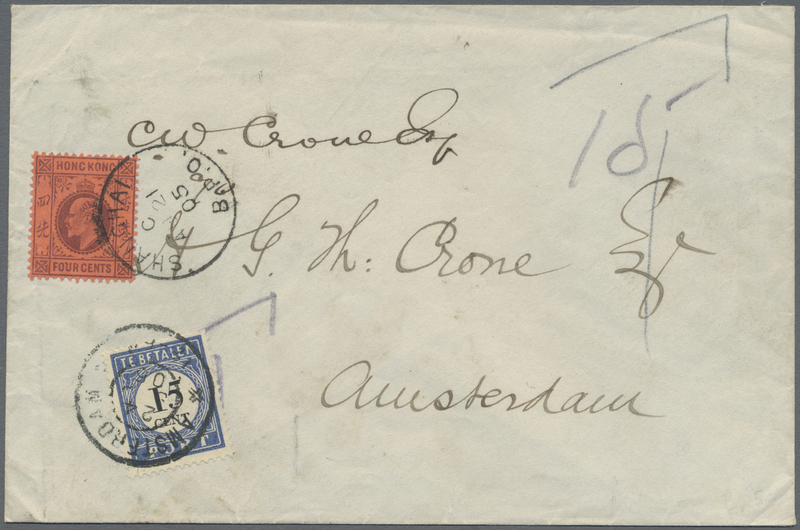 7783 Ganzsache (Complete) 1904, envelope KEVII 1 C. canc. 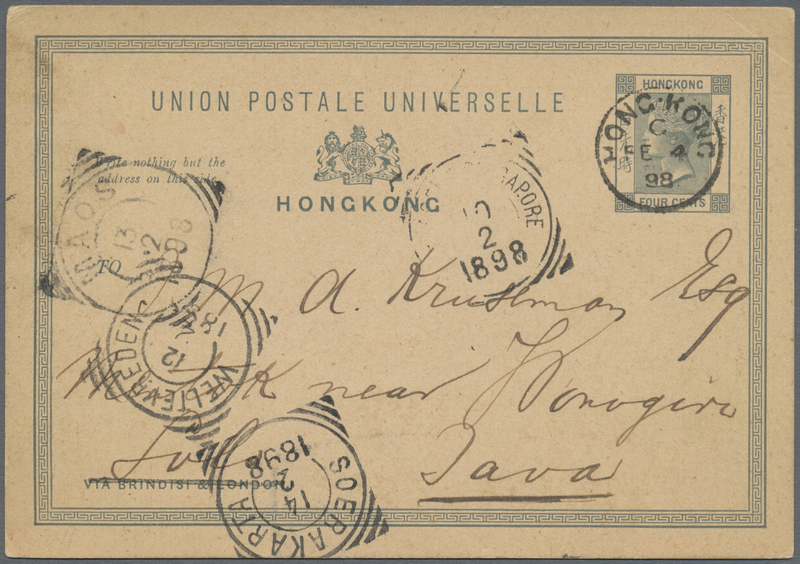 "VICTORIA HONG-KONG 21 OC 04" to Kowloon w. arrival "HONG KONG K.B. 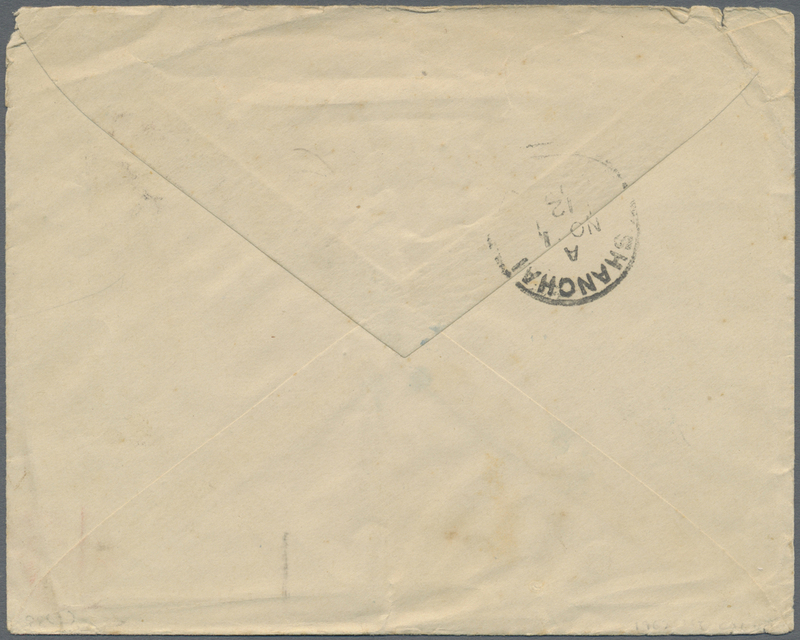 ", top soiling line, correct local unsealed rate.